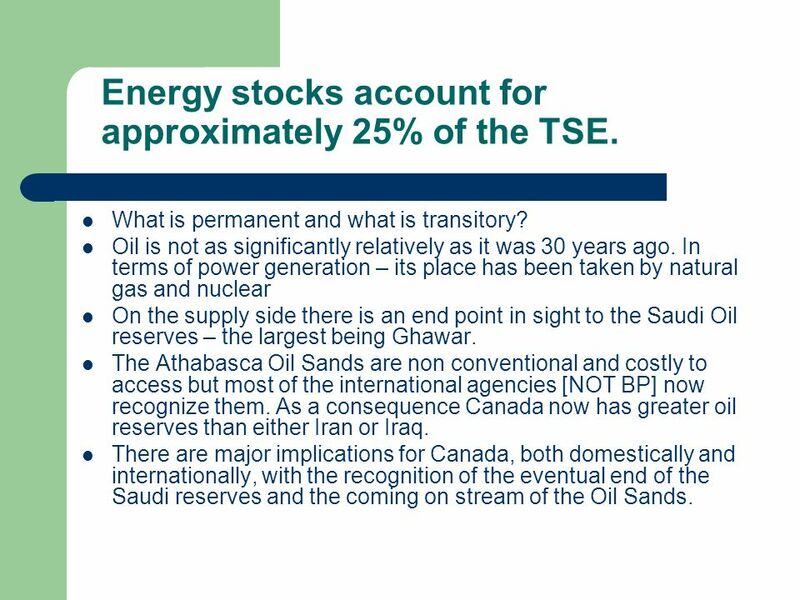 6 Energy stocks account for approximately 25% of the TSE. 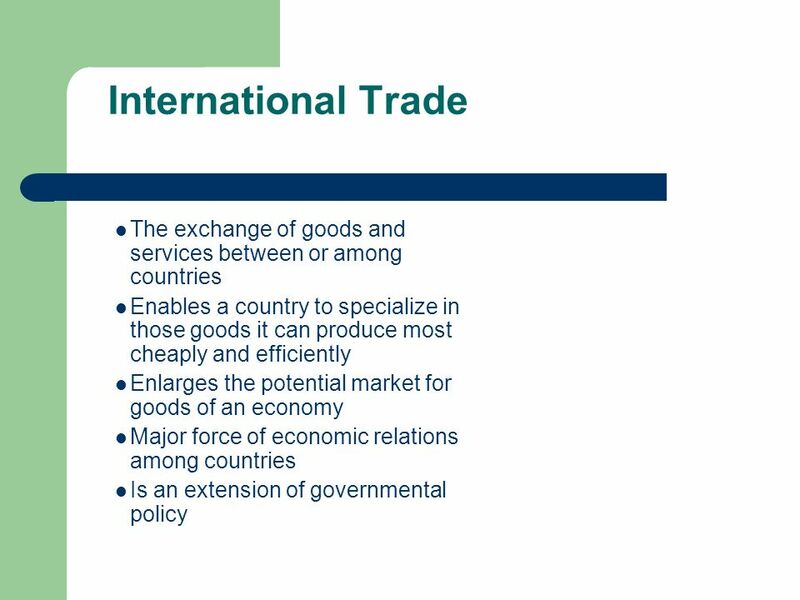 • To simultaneously achieving high employment and stable prices. 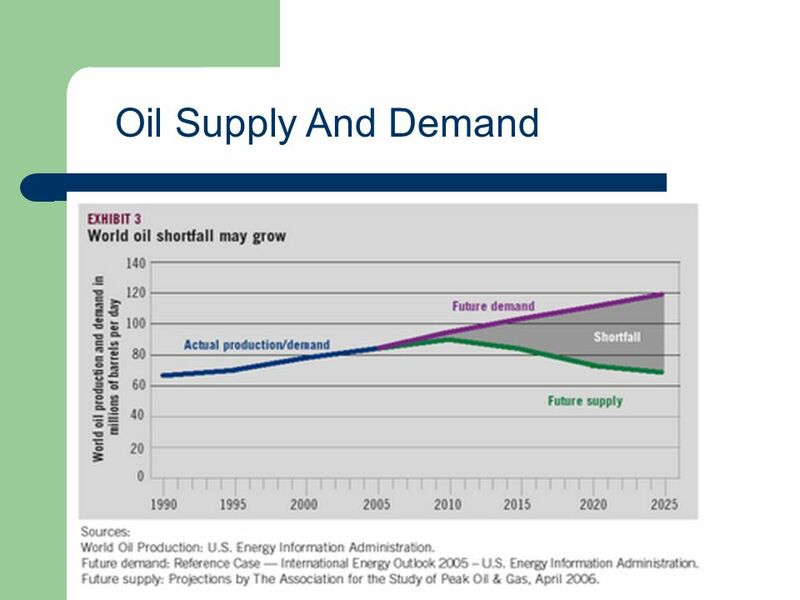 • Oil and price shocks limit that as a possibility. 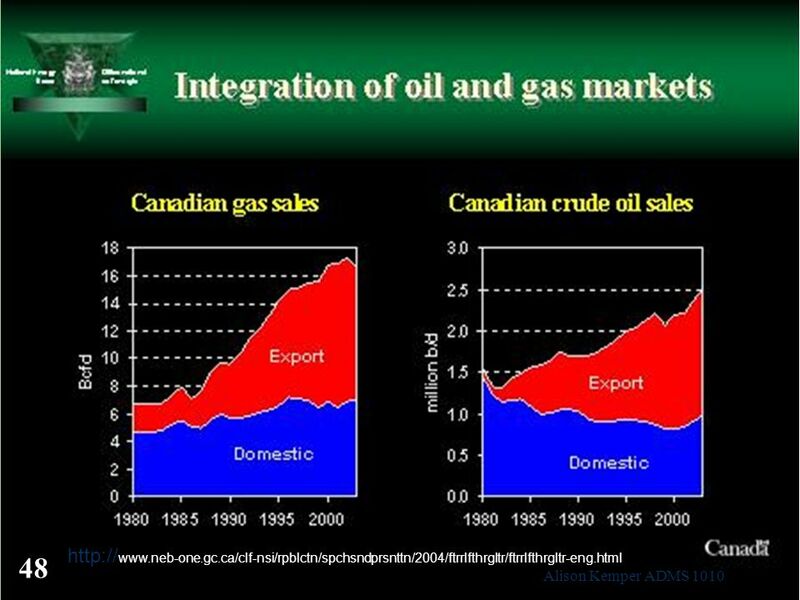 In 2009, the GDP of Canada’s energy sector – i.e. 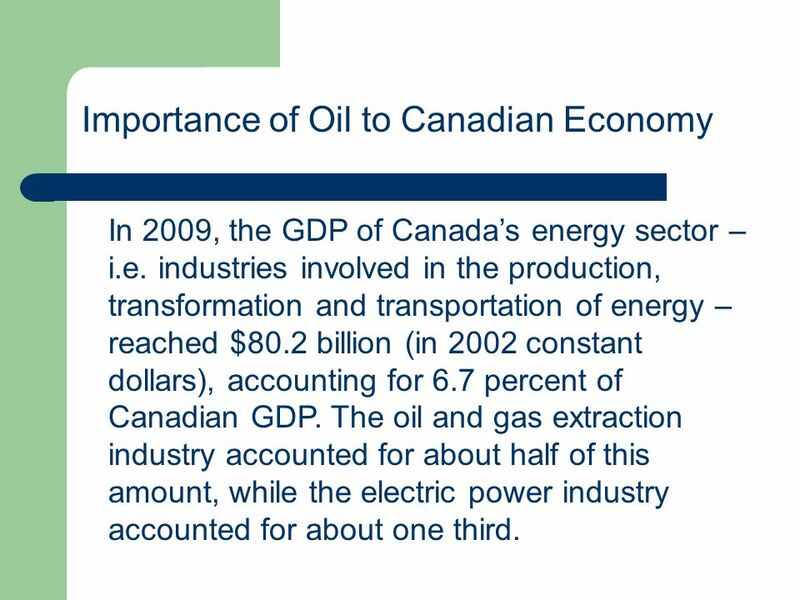 industries involved in the production, transformation and transportation of energy – reached $80.2 billion (in 2002 constant dollars), accounting for 6.7 percent of Canadian GDP. 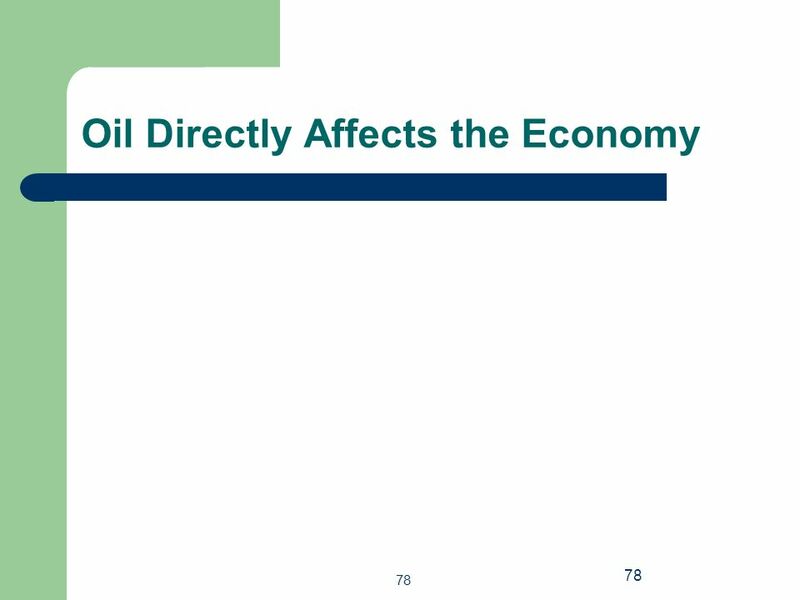 The oil and gas extraction industry accounted for about half of this amount, while the electric power industry accounted for about one third. 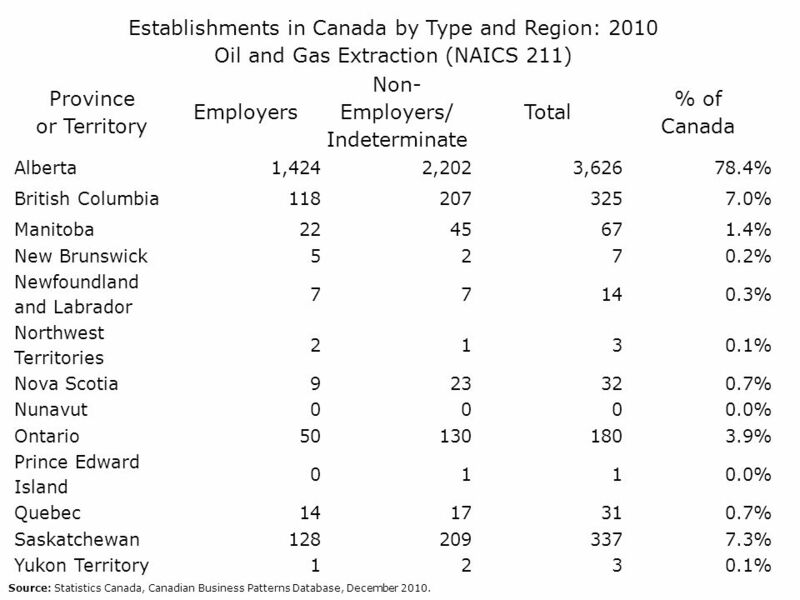 Establishments in Canada by Type and Region: Oil and Gas Extraction (NAICS 211) Province or Territory Employers Non-Employers/ Indeterminate Total % of Canada Alberta 1,424 2,202 3,626 78.4% British Columbia 118 207 325 7.0% Manitoba 22 45 67 1.4% New Brunswick 5 2 7 0.2% Newfoundland and Labrador 14 0.3% Northwest Territories 1 3 0.1% Nova Scotia 9 23 32 0.7% Nunavut 0.0% Ontario 50 130 180 3.9% Prince Edward Island Quebec 17 31 Saskatchewan 128 209 337 7.3% Yukon Territory Source: Statistics Canada, Canadian Business Patterns Database, December 2010. 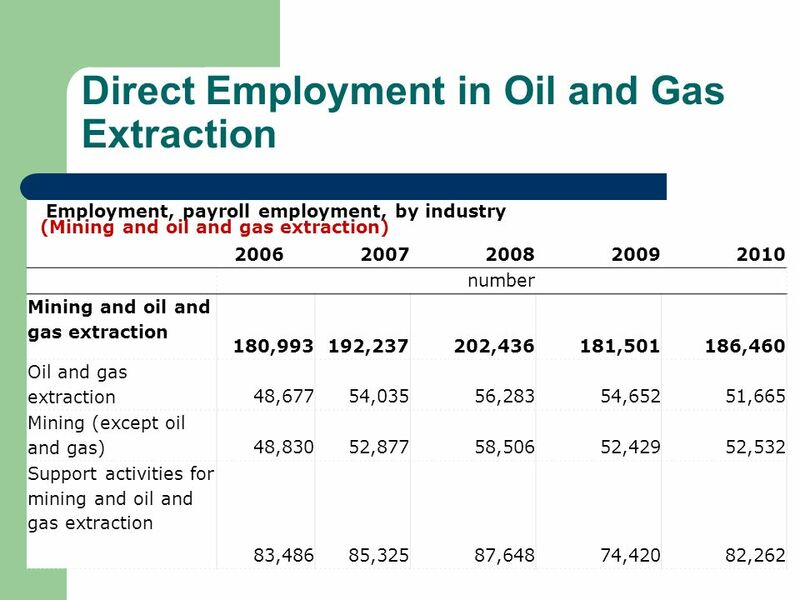 The energy sector, excluding service stations and wholesale trade in petroleum products, provided direct employment for 257 462 people in 2009, or 1.8 percent of employment in Canada. 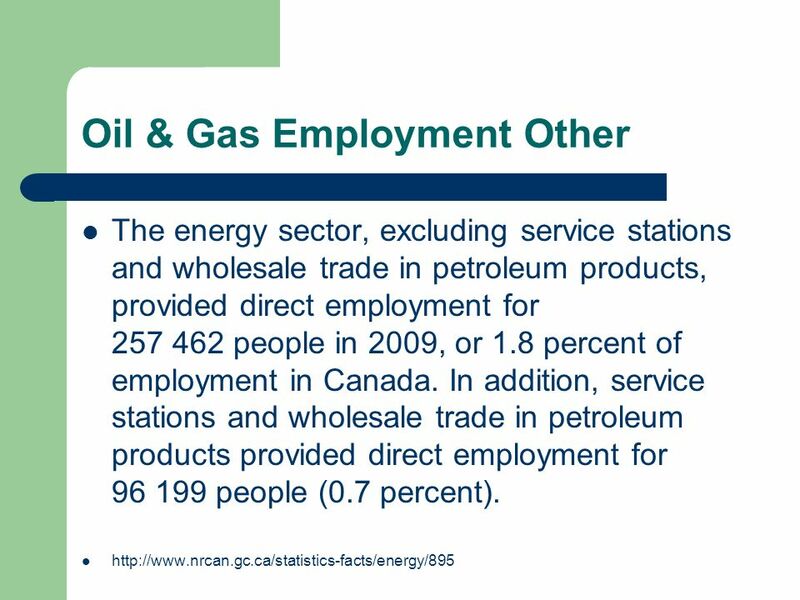 In addition, service stations and wholesale trade in petroleum products provided direct employment for 96 199 people (0.7 percent). 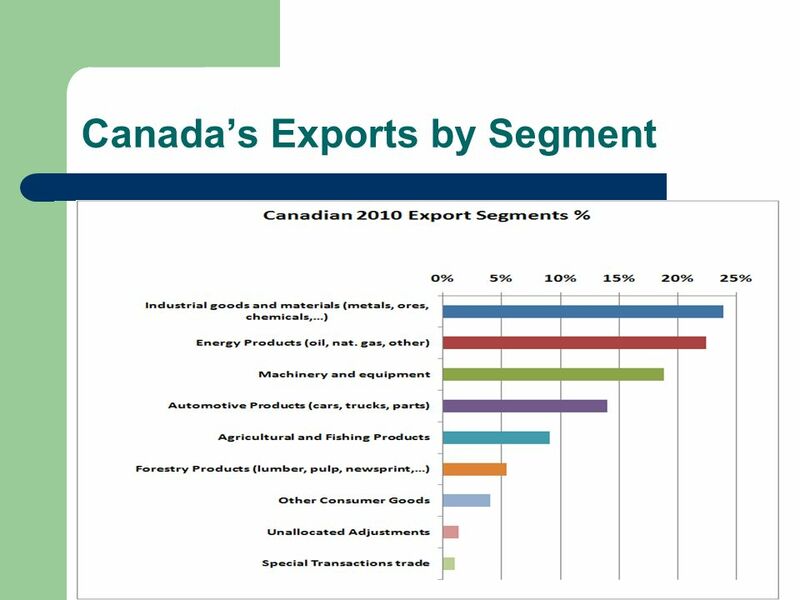 Source: Statistics Canada, Canadian Business Patterns Database, December 2010. 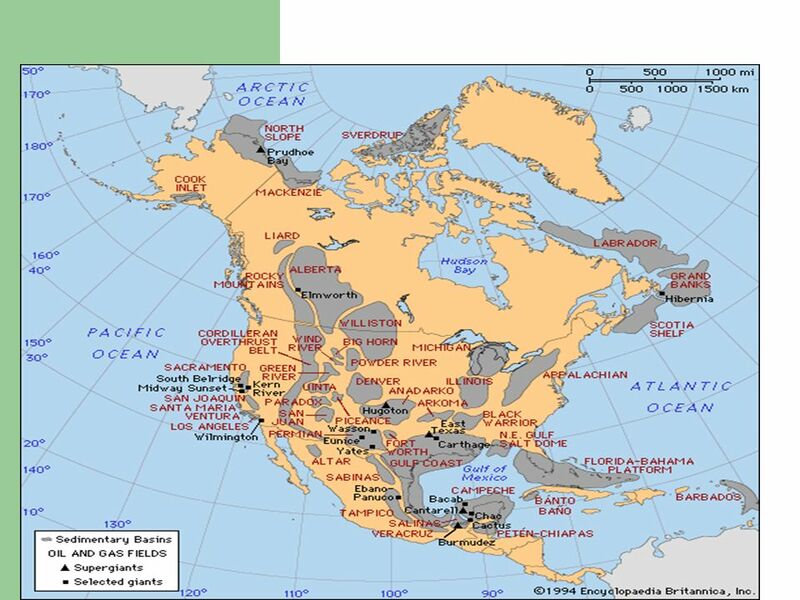 Date Event 1715 James Knight, Factor of Fort York, writes in a Hudson Bay Journal of a “gum or pitch that flows out of the banks of a river” (the Athabasca); first report by a European of the oilsands deposits in Western Canada. 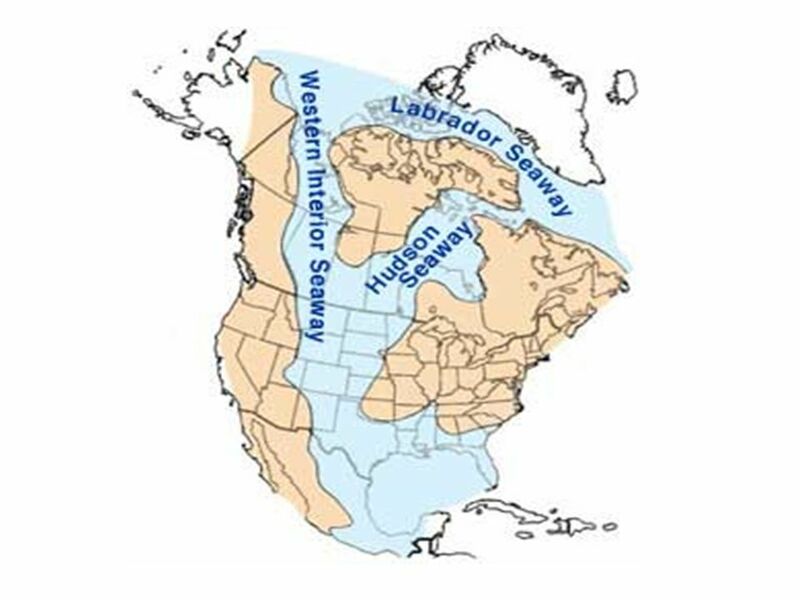 1790s Explorer Alexander Mackenzie reports first hand of “bituminous pools” along the Athabasca River. 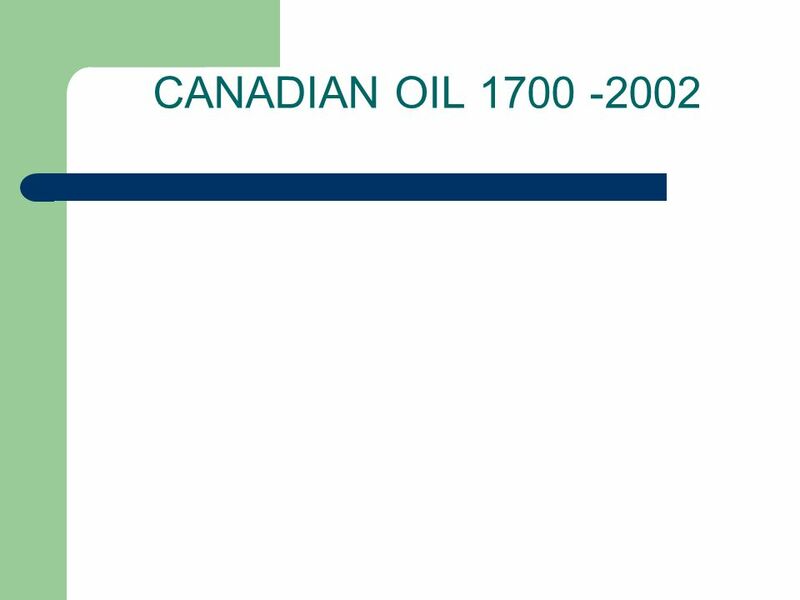 1846 to 1853 Abraham Gesner of Halifax develops a fractional distillation process to produce kerosene from coal for use as lamp oil. 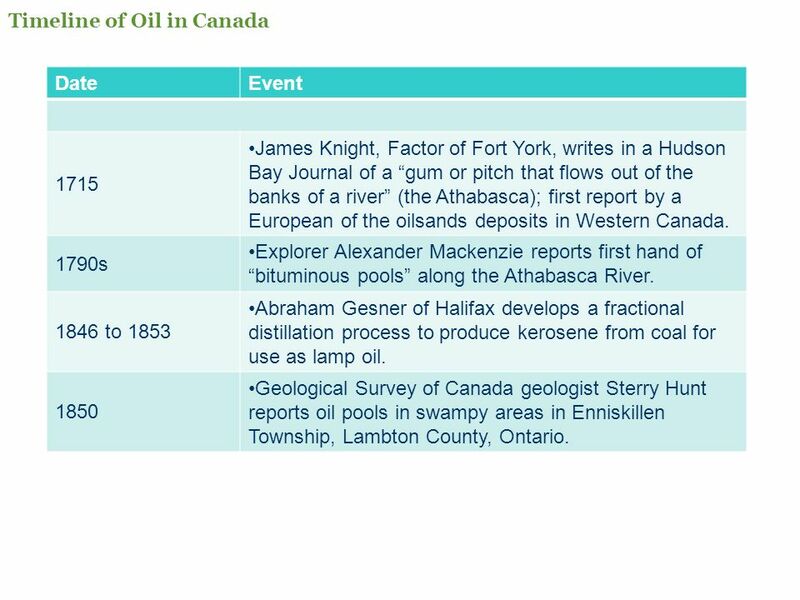 1850 Geological Survey of Canada geologist Sterry Hunt reports oil pools in swampy areas in Enniskillen Township, Lambton County, Ontario. 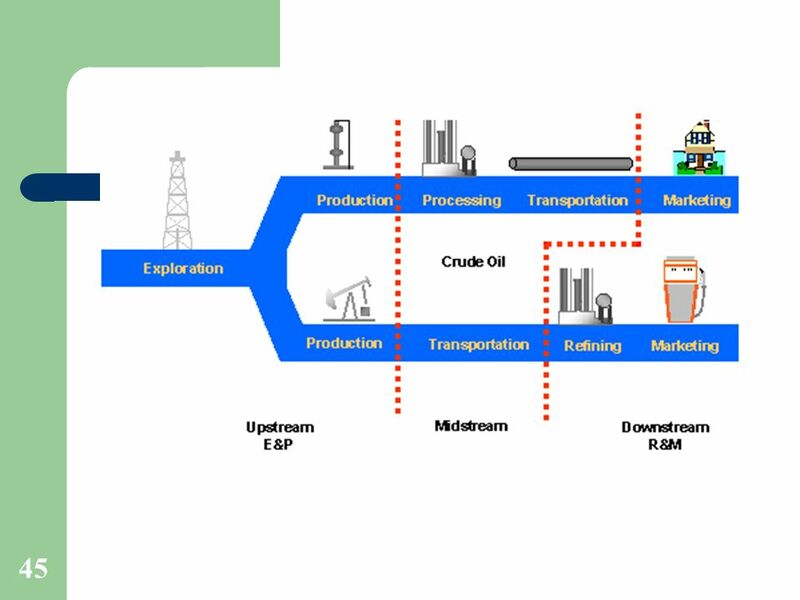 Date Event 1851 Charles Tripp founds the first registered oil company in North America, the International Mining and Manufacturing Company, to recover the oil from pits dug in Enniskillen Township, and refine it using fractional distillation. Tripp exhibits asphalt from his plant at the Universal Exhibition in Paris. 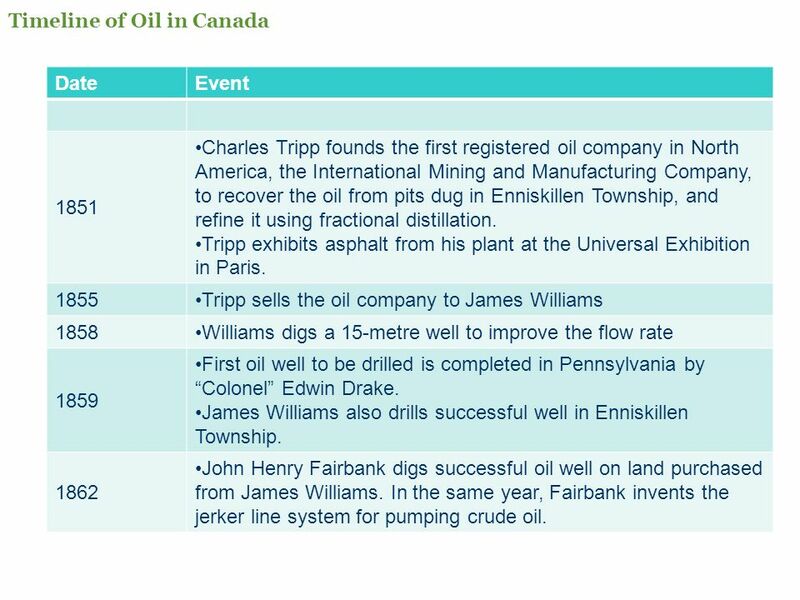 1855 Tripp sells the oil company to James Williams 1858 Williams digs a 15-metre well to improve the flow rate 1859 First oil well to be drilled is completed in Pennsylvania by “Colonel” Edwin Drake. 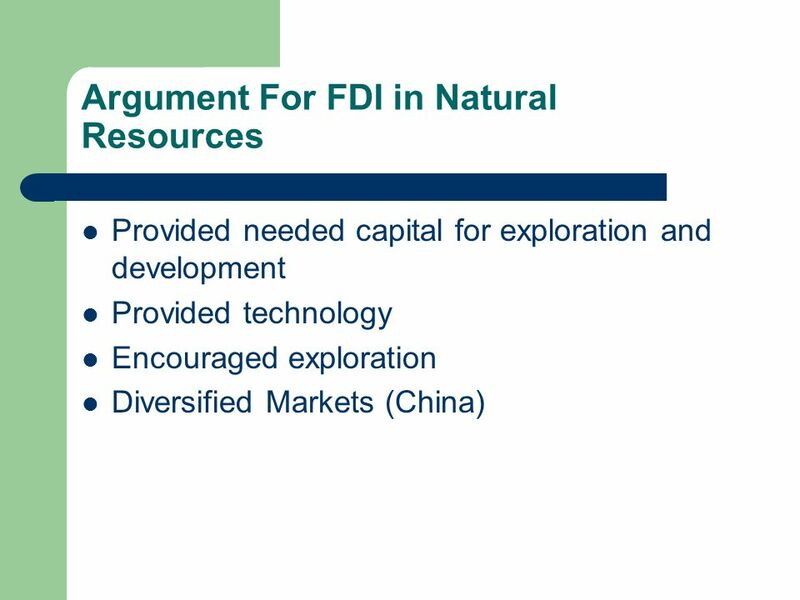 James Williams also drills successful well in Enniskillen Township. 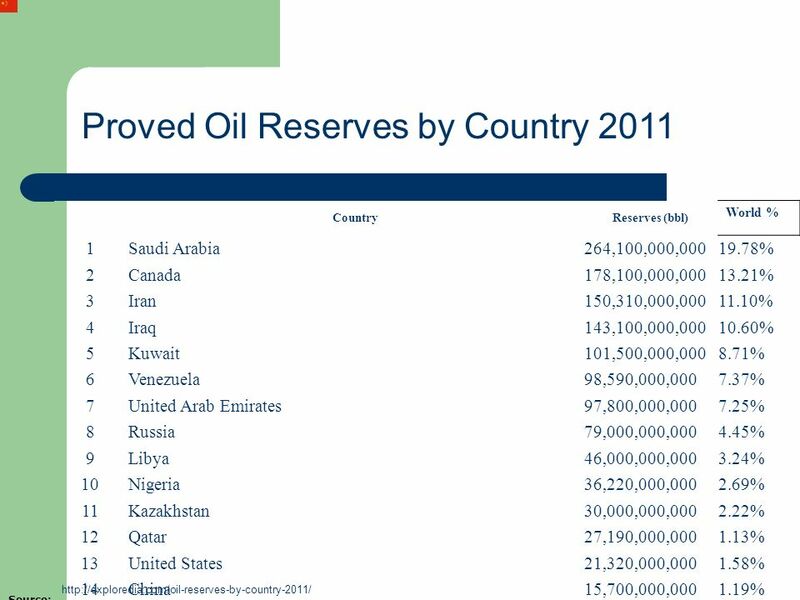 1862 John Henry Fairbank digs successful oil well on land purchased from James Williams. 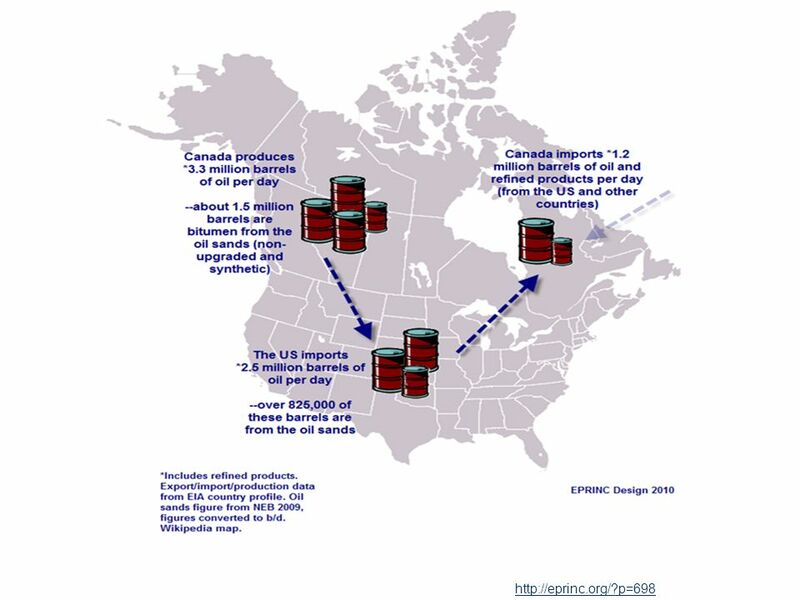 In the same year, Fairbank invents the jerker line system for pumping crude oil. 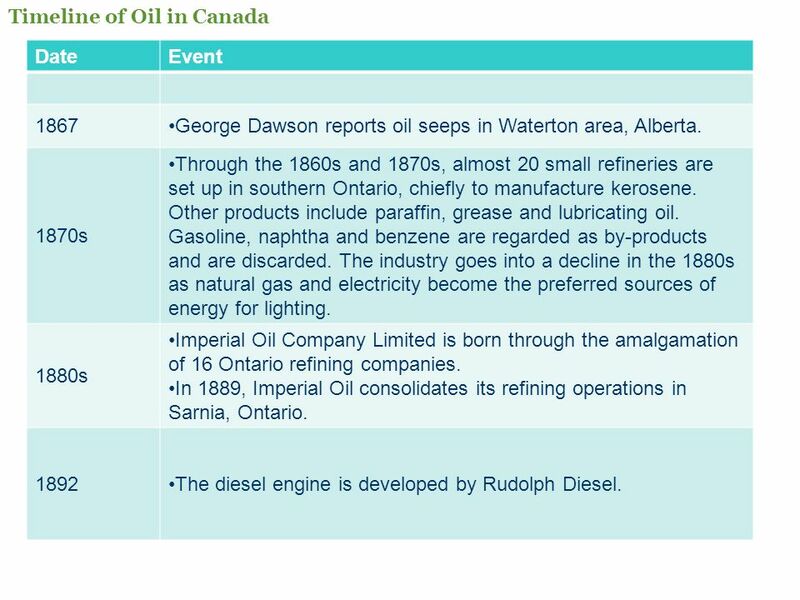 Date Event 1867 George Dawson reports oil seeps in Waterton area, Alberta. 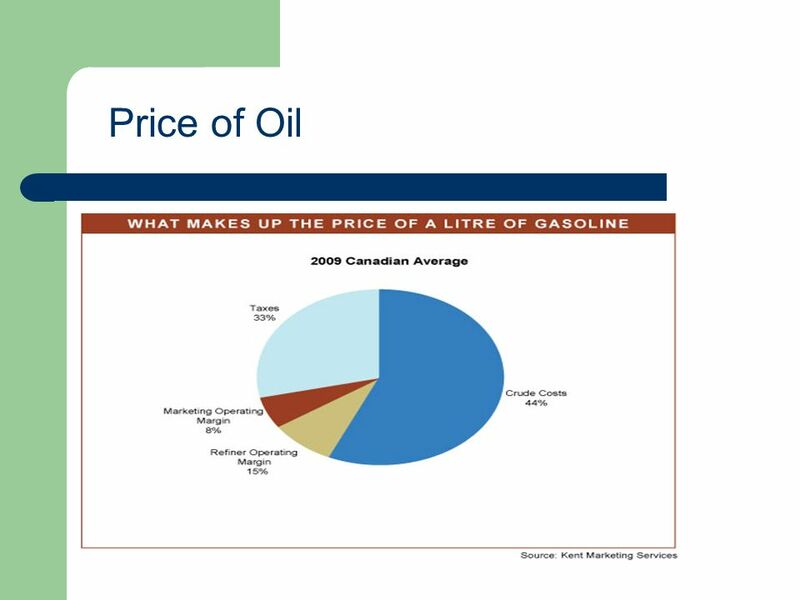 1870s Through the 1860s and 1870s, almost 20 small refineries are set up in southern Ontario, chiefly to manufacture kerosene. 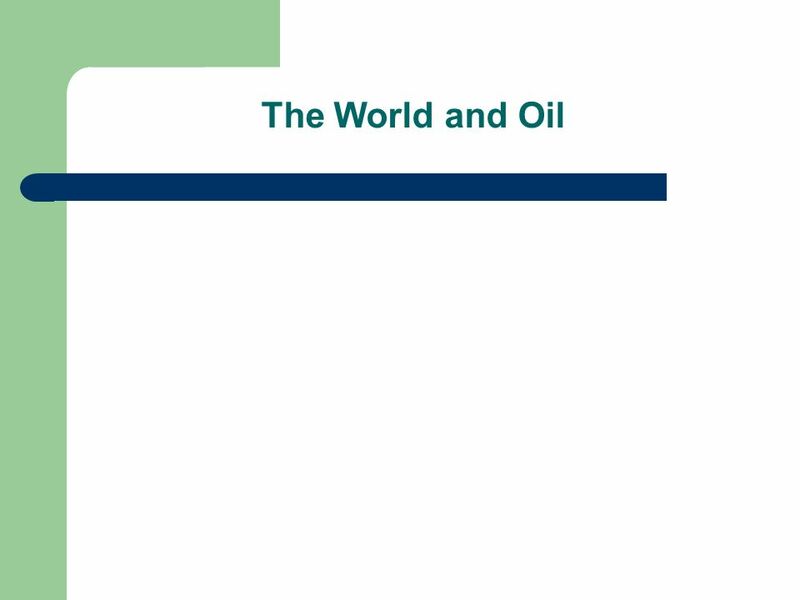 Other products include paraffin, grease and lubricating oil. 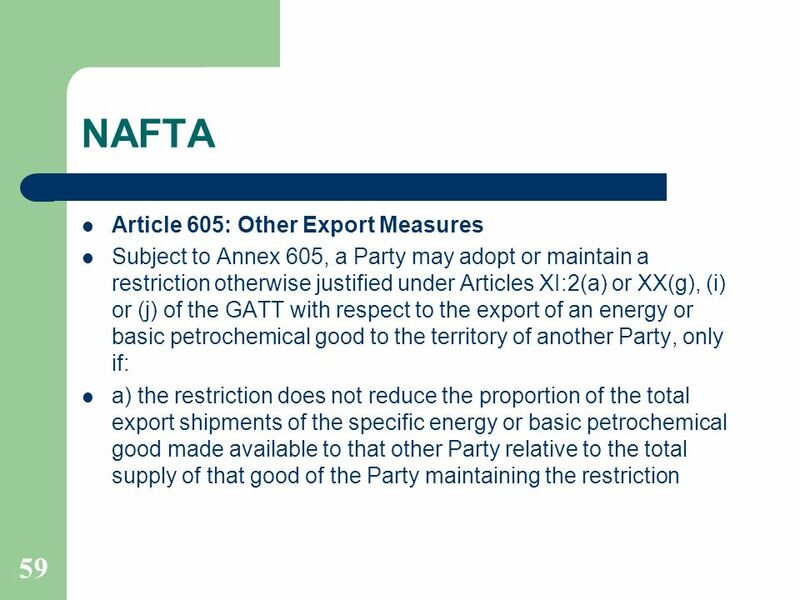 Gasoline, naphtha and benzene are regarded as by-products and are discarded. 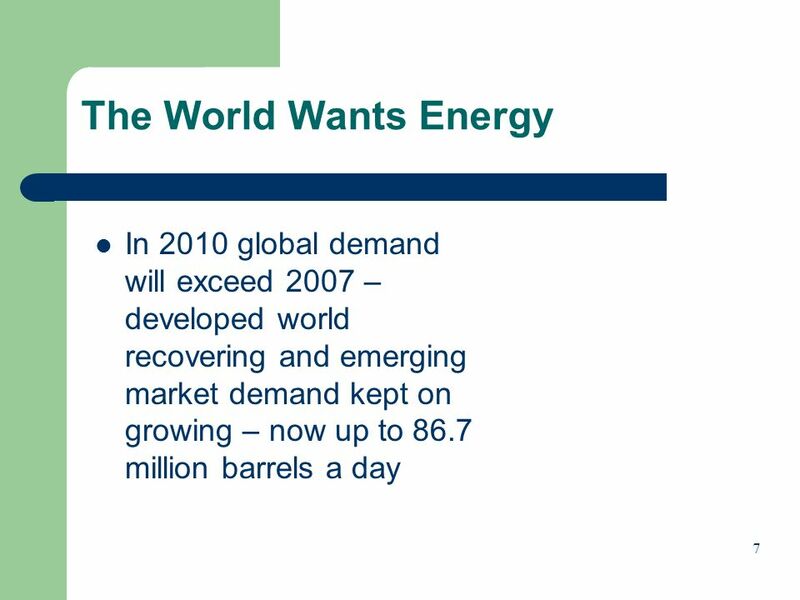 The industry goes into a decline in the 1880s as natural gas and electricity become the preferred sources of energy for lighting. 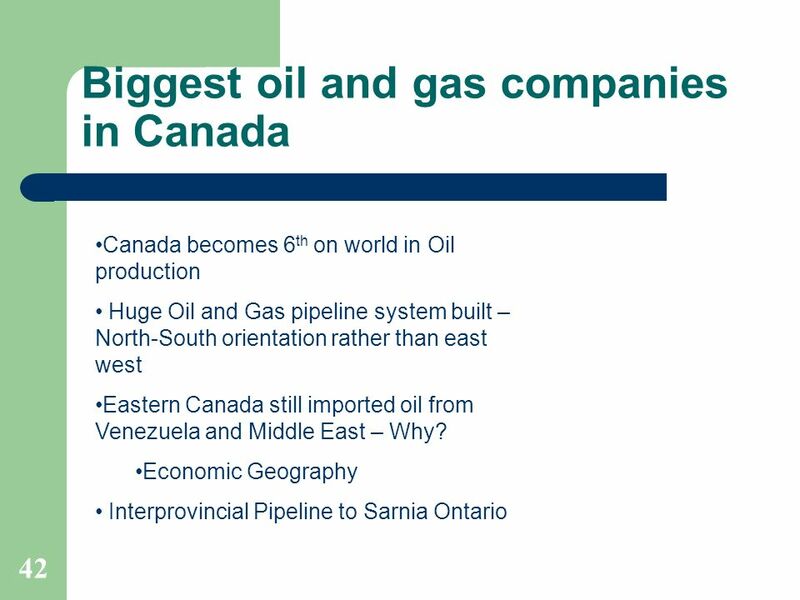 1880s Imperial Oil Company Limited is born through the amalgamation of 16 Ontario refining companies. 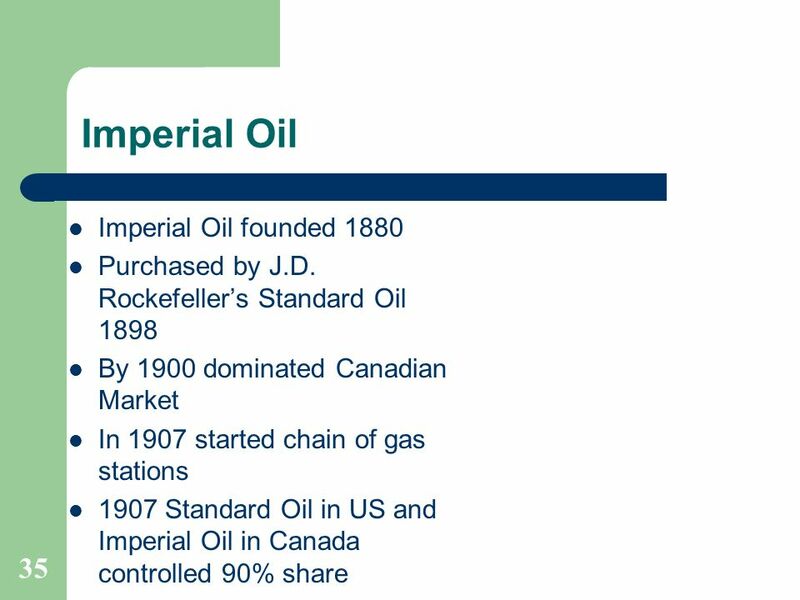 In 1889, Imperial Oil consolidates its refining operations in Sarnia, Ontario. 1892 The diesel engine is developed by Rudolph Diesel. 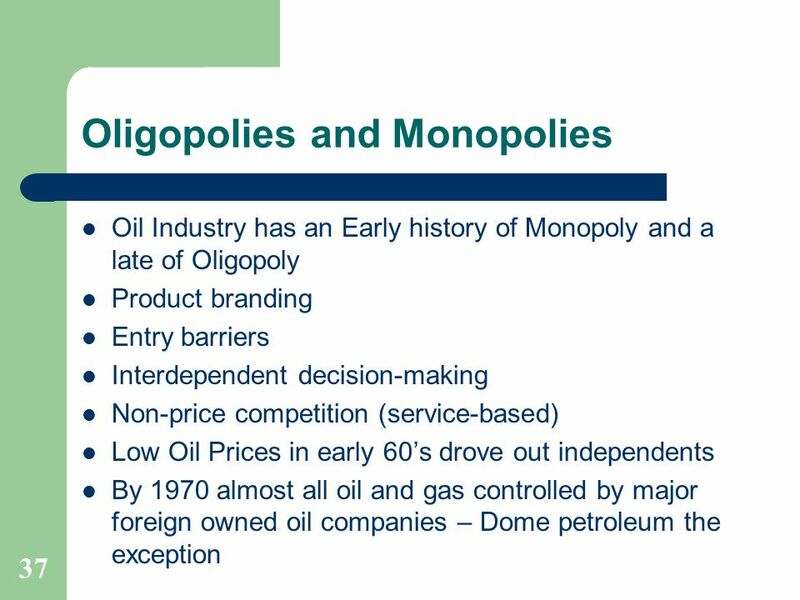 Date Event 1898 Imperial Oil is acquired by U.S. oil conglomerate Standard Oil. 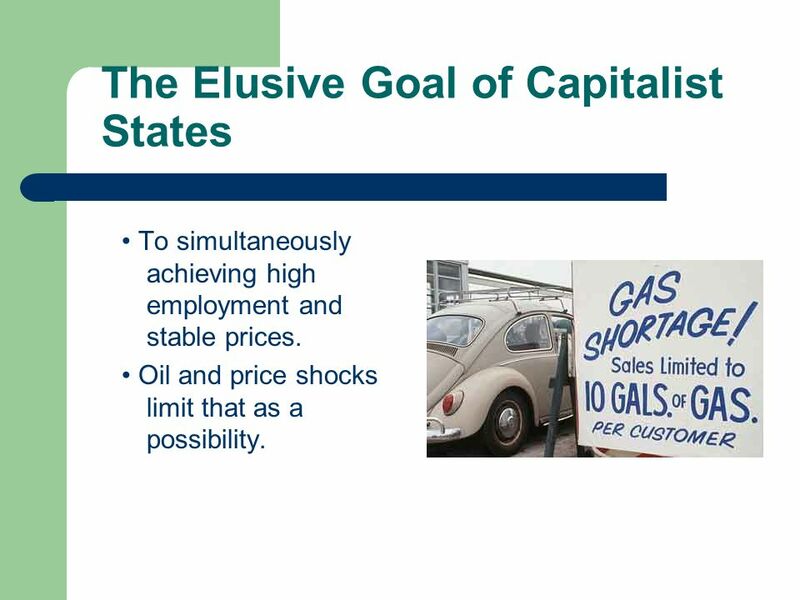 1905 Automobiles powered by gasoline engines begin to gain wide popularity, providing a market for a byproduct of refining that previously had often just been discarded. 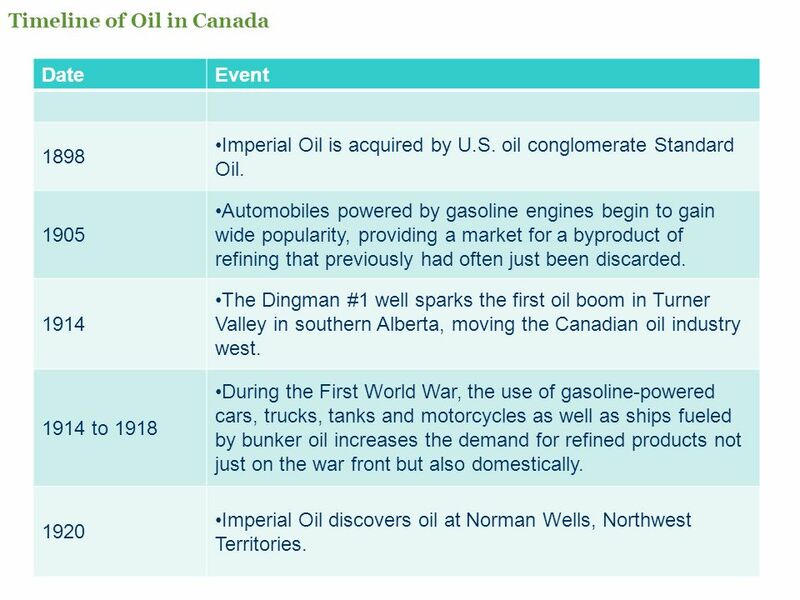 1914 The Dingman #1 well sparks the first oil boom in Turner Valley in southern Alberta, moving the Canadian oil industry west. 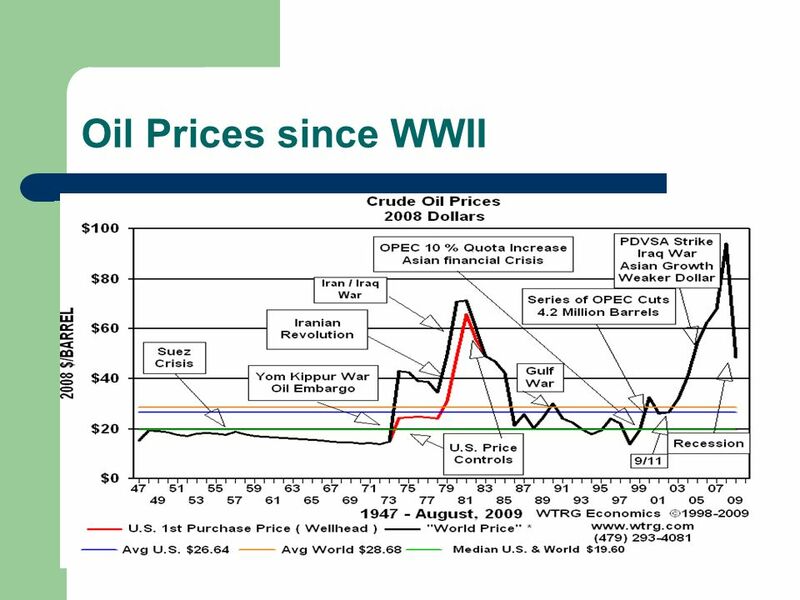 1914 to 1918 During the First World War, the use of gasoline-powered cars, trucks, tanks and motorcycles as well as ships fueled by bunker oil increases the demand for refined products not just on the war front but also domestically. 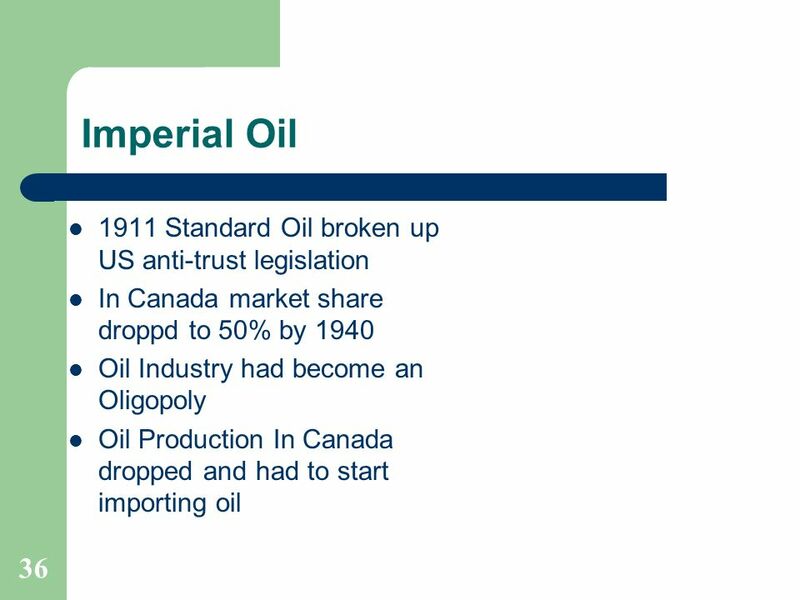 1920 Imperial Oil discovers oil at Norman Wells, Northwest Territories. 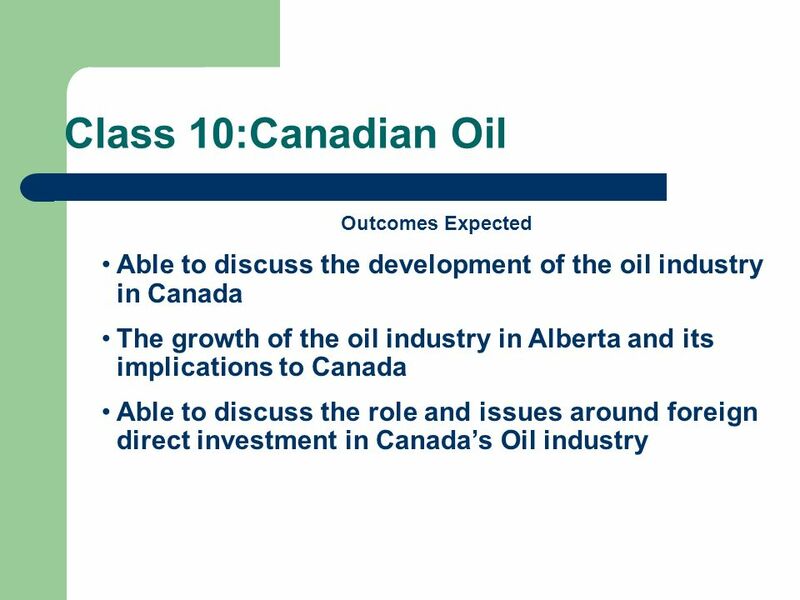 Date Event 1924 The Royalite #4 well sparks a second oil boom in Turner Valley, Alberta with flow rates of 21MMcf/d of natural gas and 600 bbls/d of white naphtha. 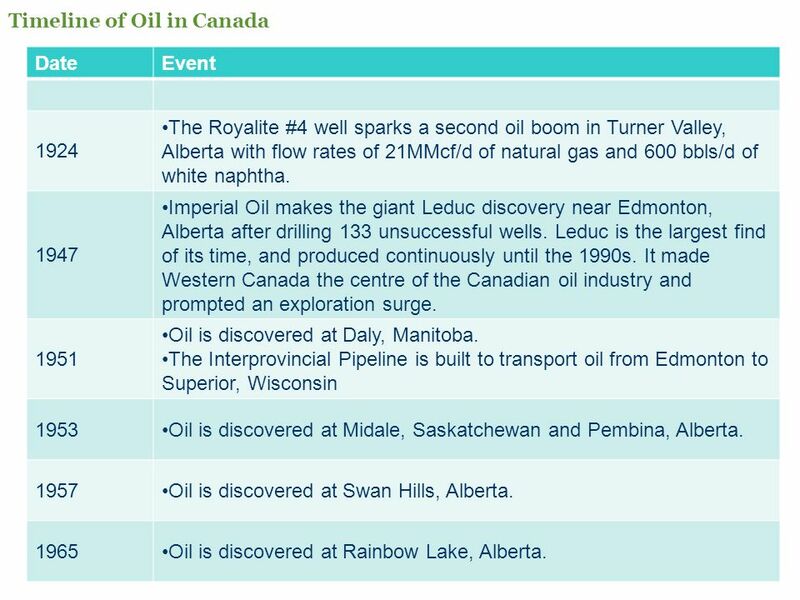 1947 Imperial Oil makes the giant Leduc discovery near Edmonton, Alberta after drilling 133 unsuccessful wells. 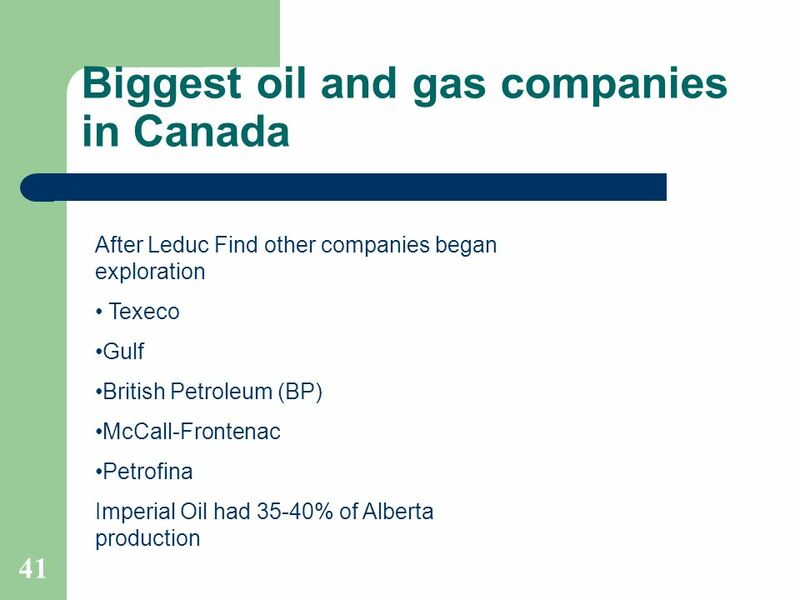 Leduc is the largest find of its time, and produced continuously until the 1990s. 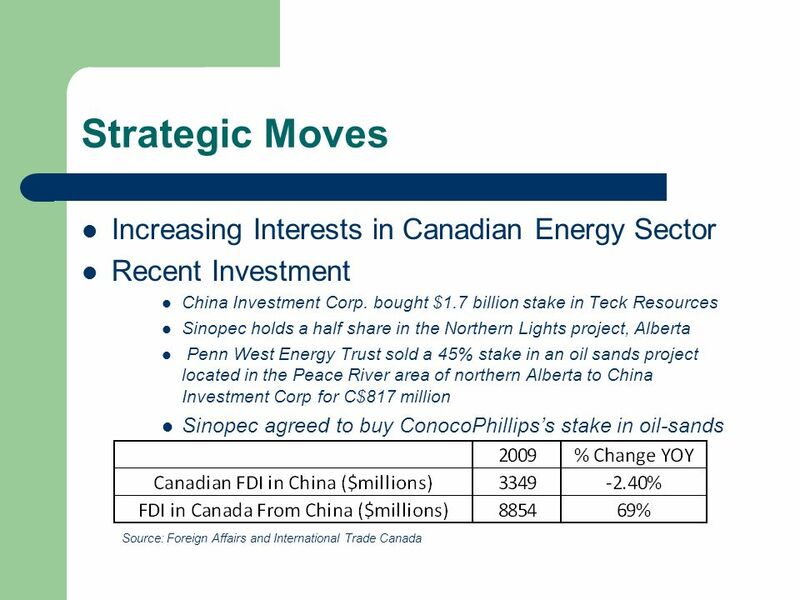 It made Western Canada the centre of the Canadian oil industry and prompted an exploration surge. 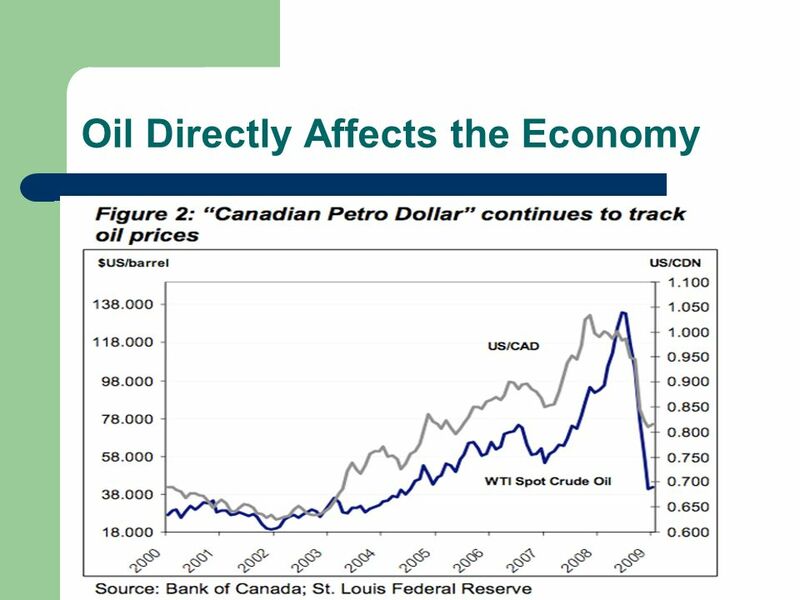 1951 Oil is discovered at Daly, Manitoba. 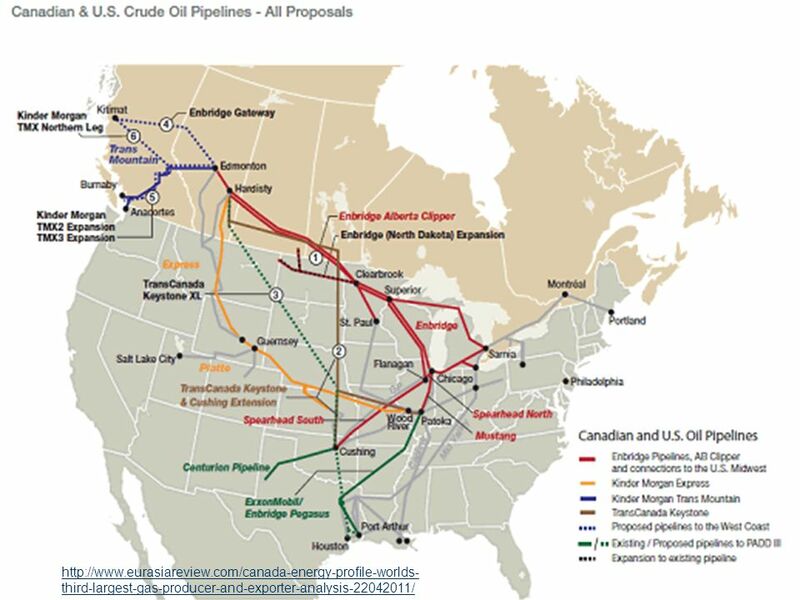 The Interprovincial Pipeline is built to transport oil from Edmonton to Superior, Wisconsin 1953 Oil is discovered at Midale, Saskatchewan and Pembina, Alberta. 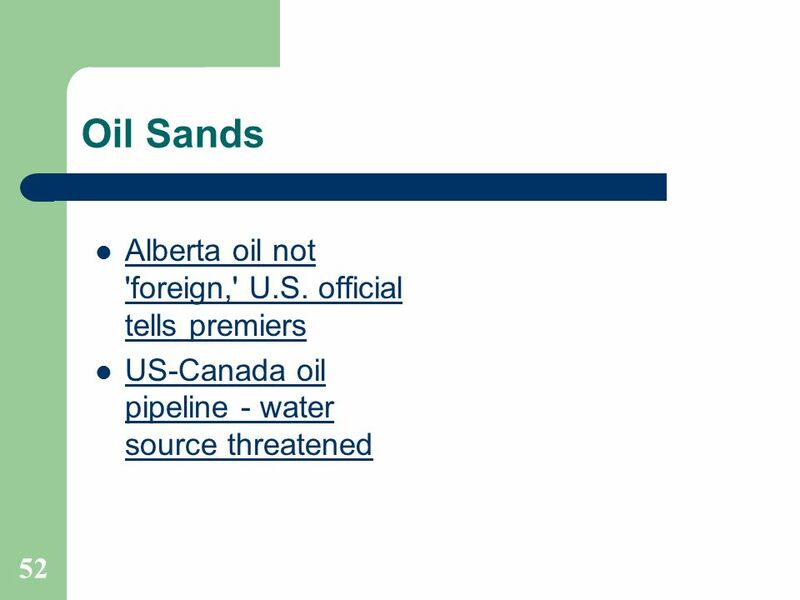 1957 Oil is discovered at Swan Hills, Alberta. 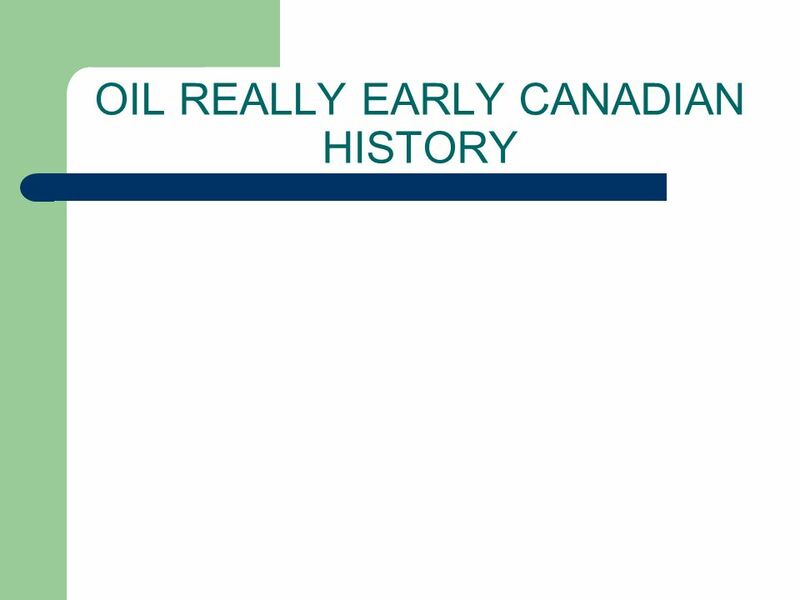 1965 Oil is discovered at Rainbow Lake, Alberta. 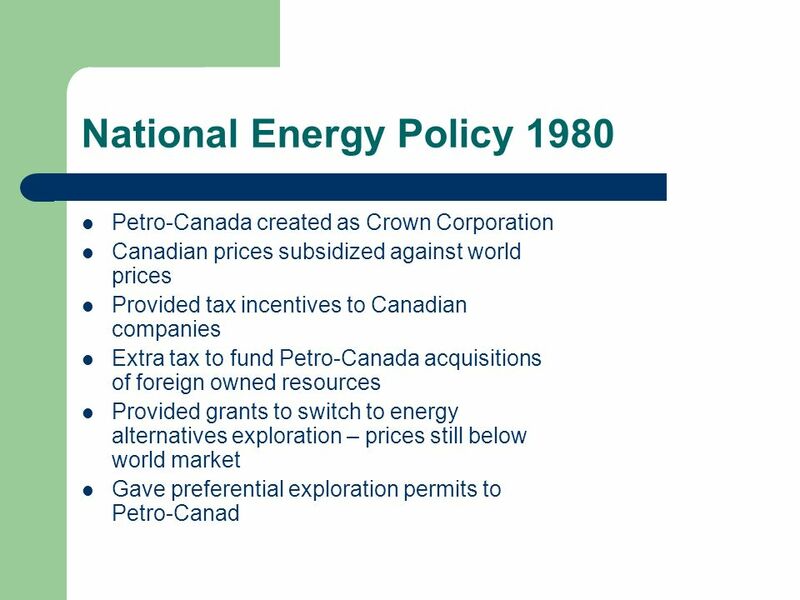 Date Event 1972 The federal and BC governments impose a moratorium on West Coast drilling. 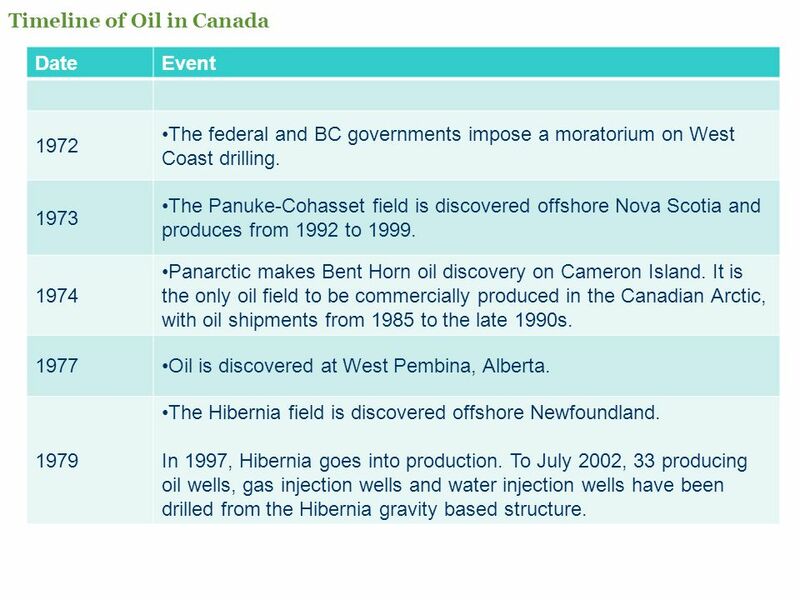 1973 The Panuke-Cohasset field is discovered offshore Nova Scotia and produces from 1992 to 1999. 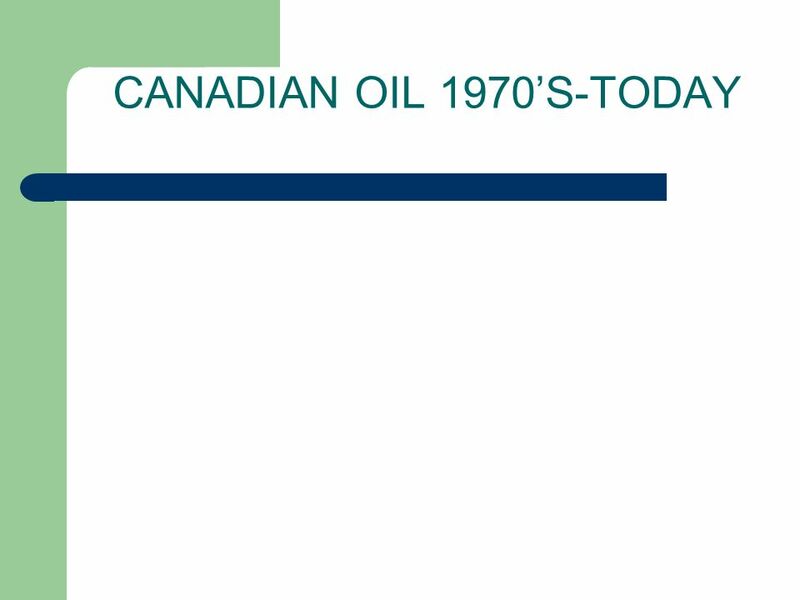 1974 Panarctic makes Bent Horn oil discovery on Cameron Island. 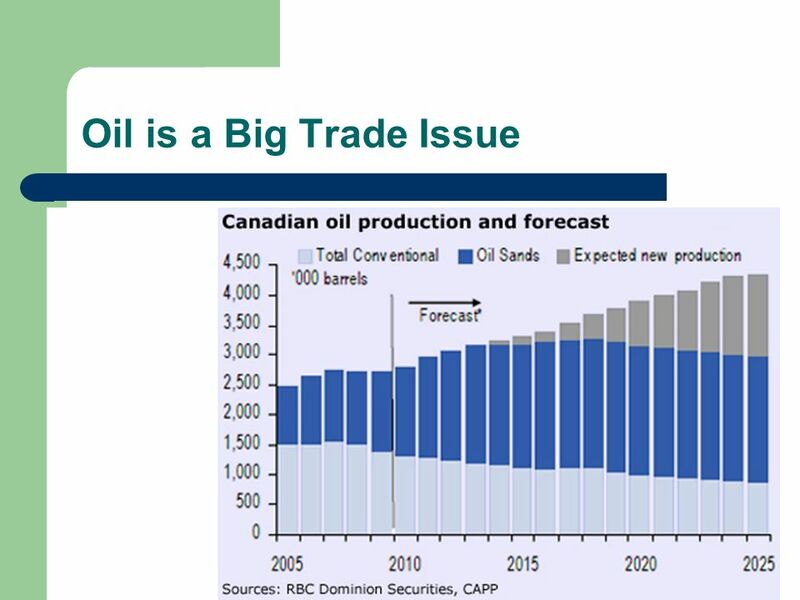 It is the only oil field to be commercially produced in the Canadian Arctic, with oil shipments from 1985 to the late 1990s. 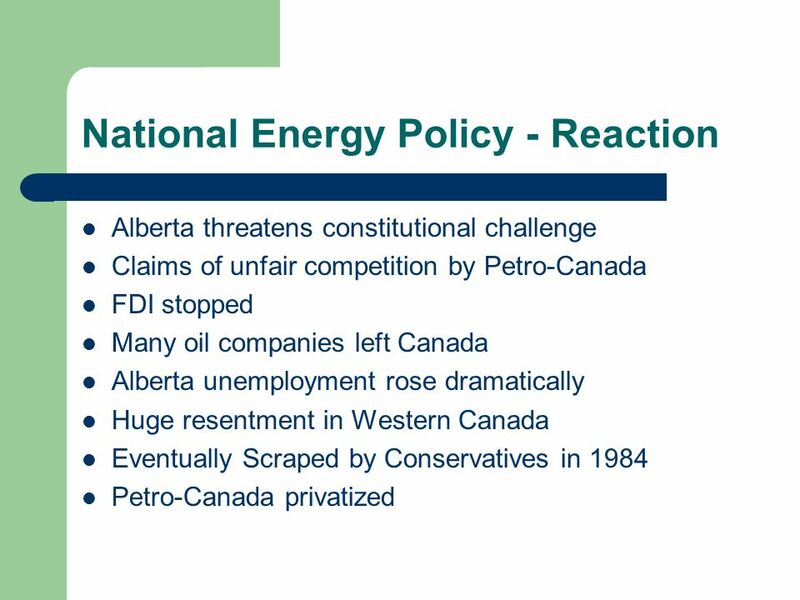 1977 Oil is discovered at West Pembina, Alberta. 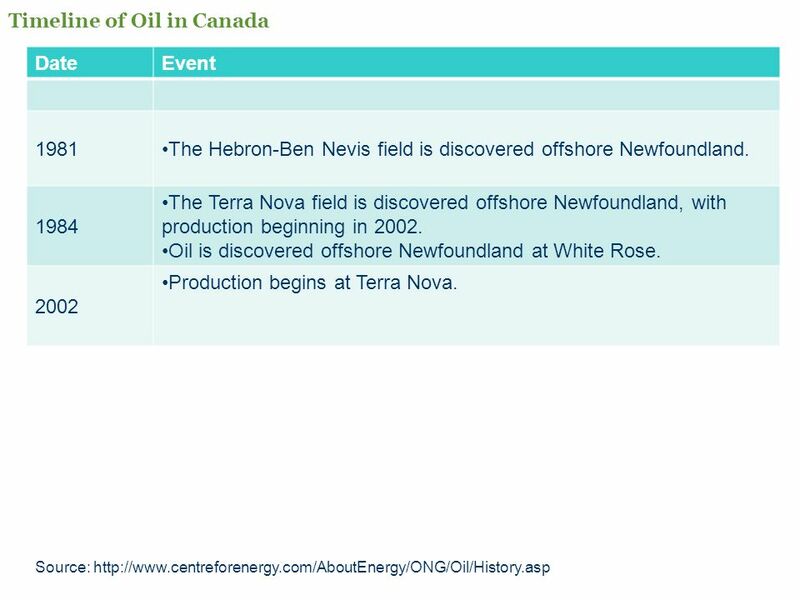 1979 The Hibernia field is discovered offshore Newfoundland. In 1997, Hibernia goes into production. 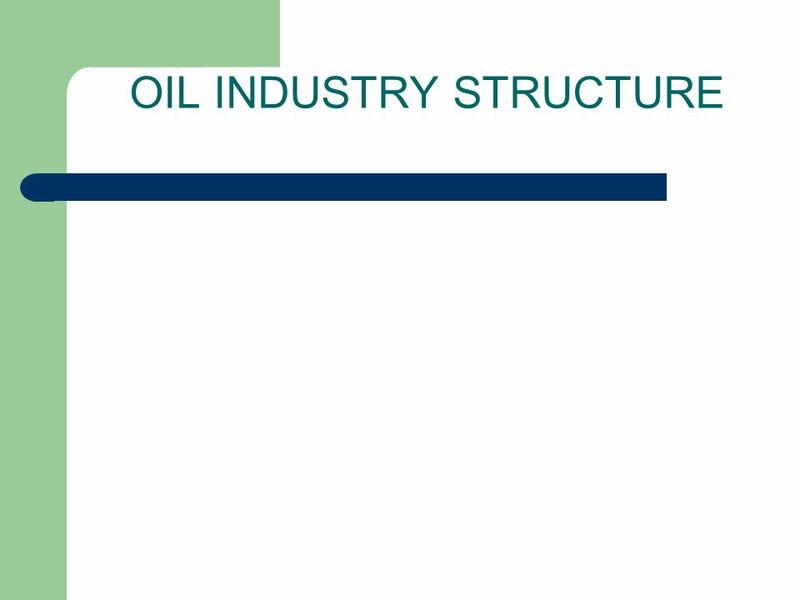 To July 2002, 33 producing oil wells, gas injection wells and water injection wells have been drilled from the Hibernia gravity based structure. 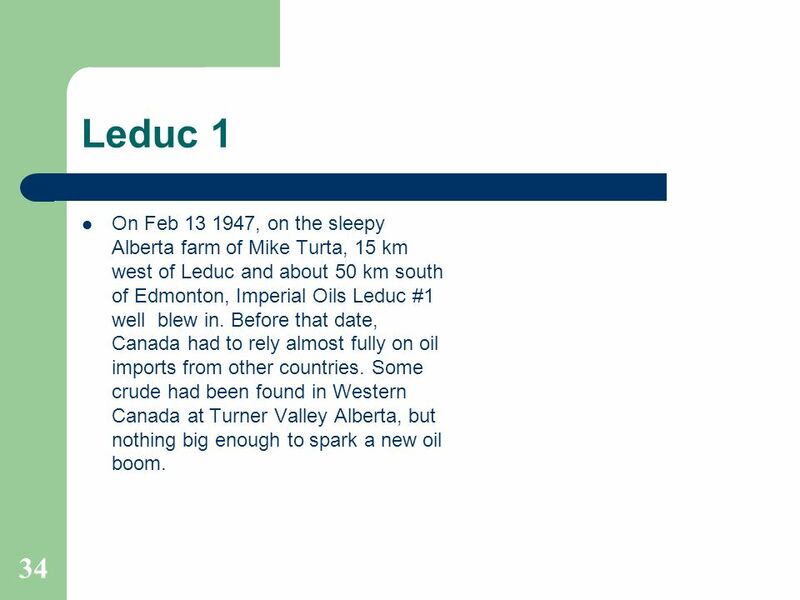 34 Leduc 1 On Feb , on the sleepy Alberta farm of Mike Turta, 15 km west of Leduc and about 50 km south of Edmonton, Imperial Oils Leduc #1 well blew in. 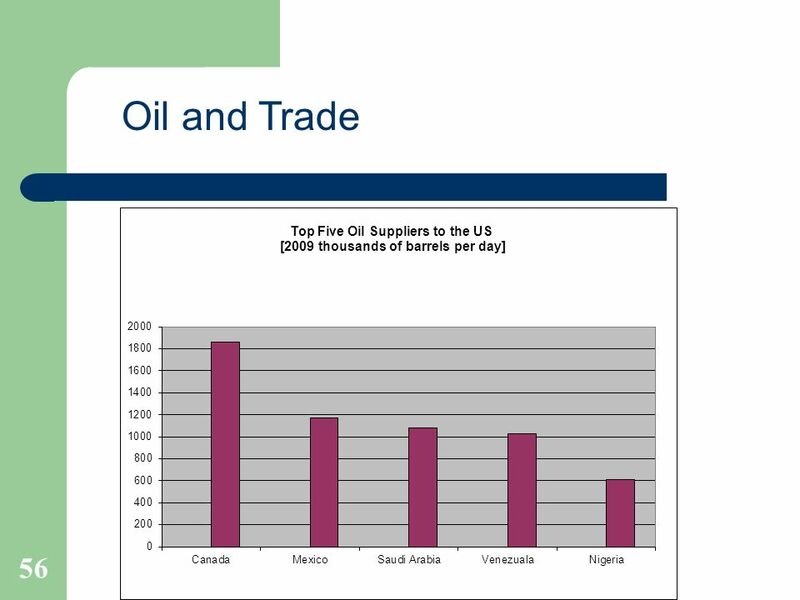 Before that date, Canada had to rely almost fully on oil imports from other countries. 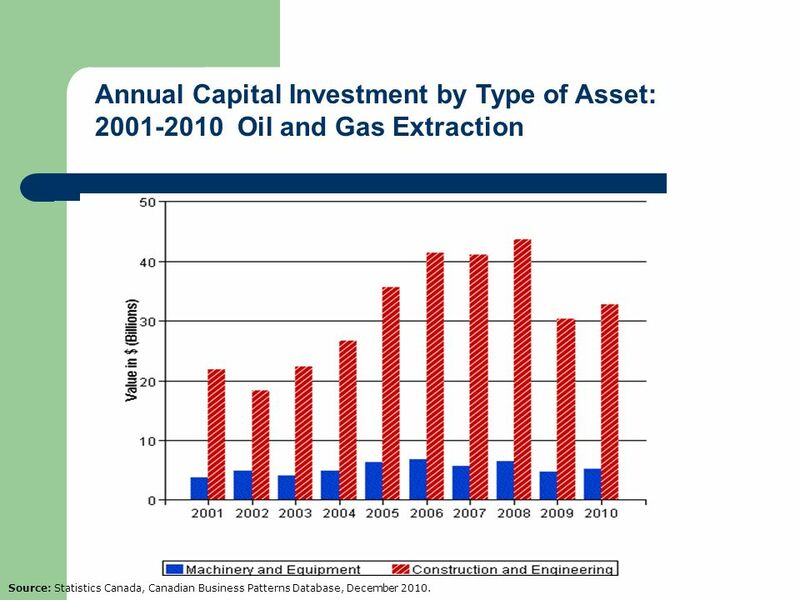 Some crude had been found in Western Canada at Turner Valley Alberta, but nothing big enough to spark a new oil boom. 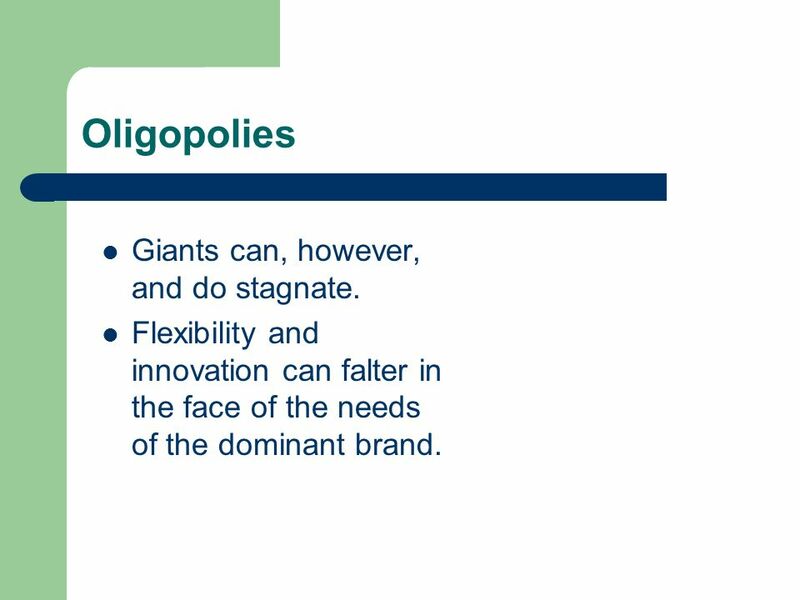 39 Oligopolies Giants can, however, and do stagnate. 40 Imperial Oil Leduc 1 On May 10, 1947, Leduc No. 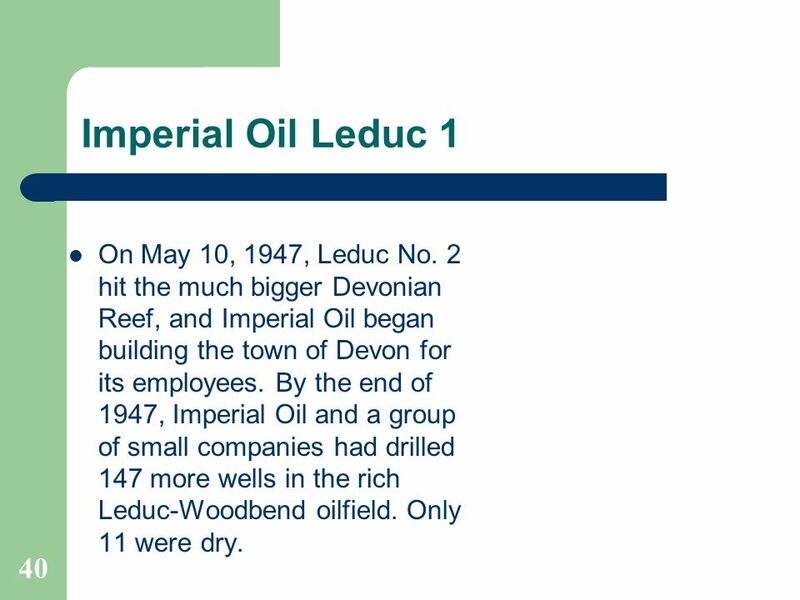 2 hit the much bigger Devonian Reef, and Imperial Oil began building the town of Devon for its employees. 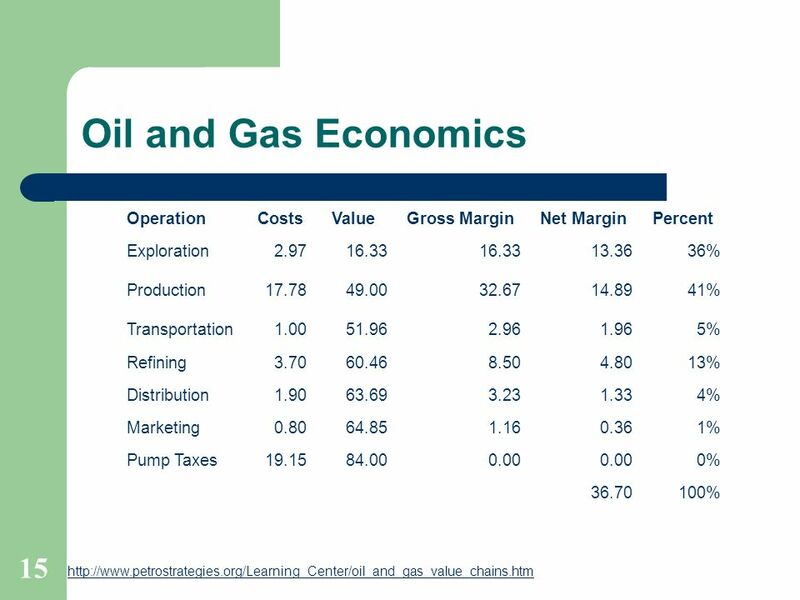 By the end of 1947, Imperial Oil and a group of small companies had drilled 147 more wells in the rich Leduc-Woodbend oilfield. 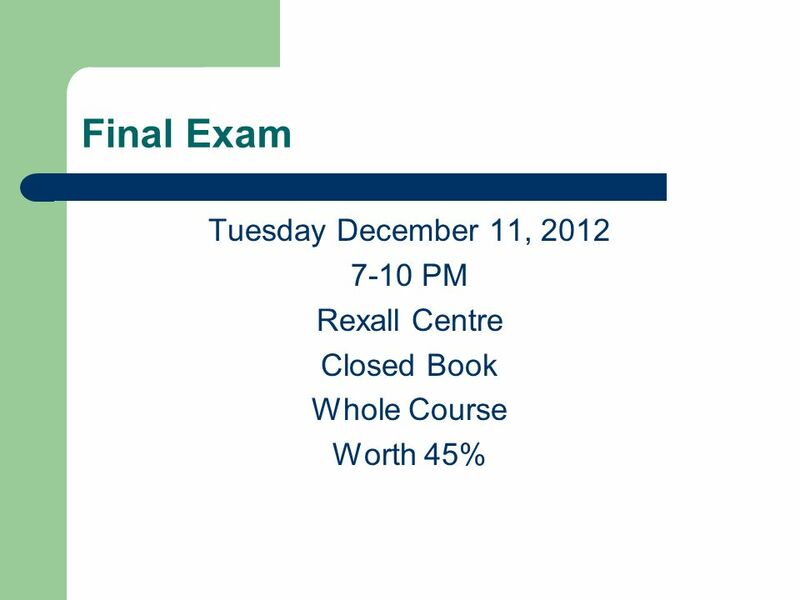 Only 11 were dry. 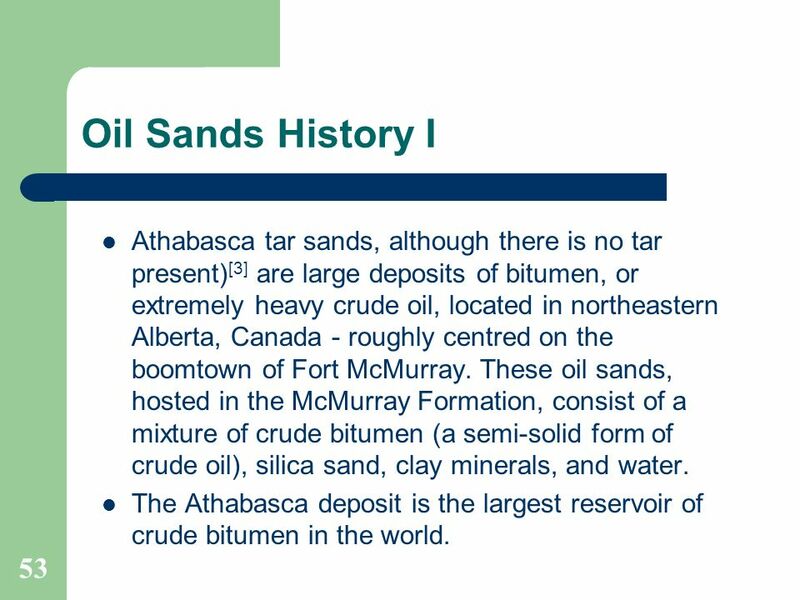 53 Oil Sands History I Athabasca tar sands, although there is no tar present) are large deposits of bitumen, or extremely heavy crude oil, located in northeastern Alberta, Canada - roughly centred on the boomtown of Fort McMurray. 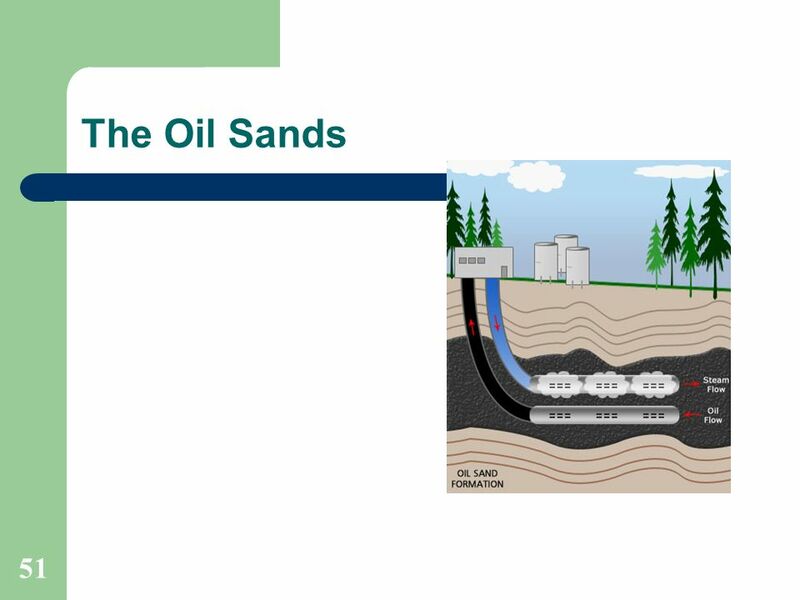 These oil sands, hosted in the McMurray Formation, consist of a mixture of crude bitumen (a semi-solid form of crude oil), silica sand, clay minerals, and water. 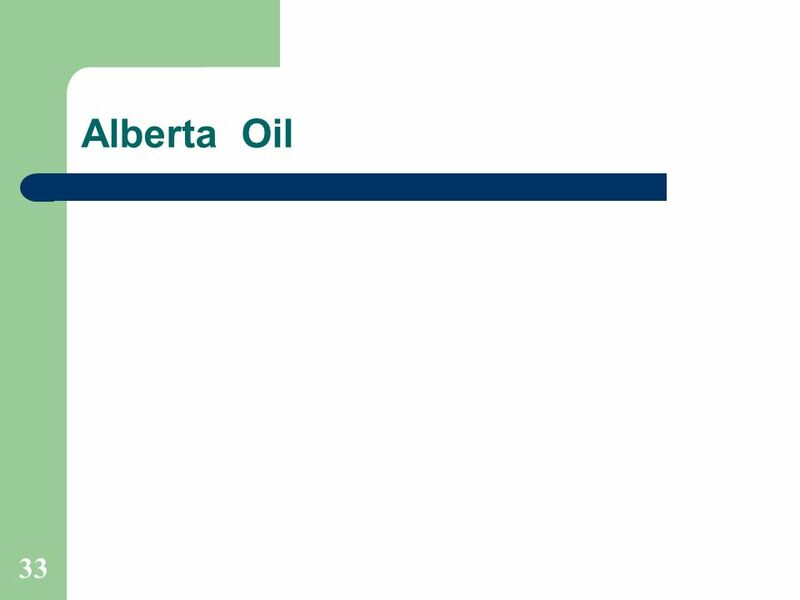 The Athabasca deposit is the largest reservoir of crude bitumen in the world. 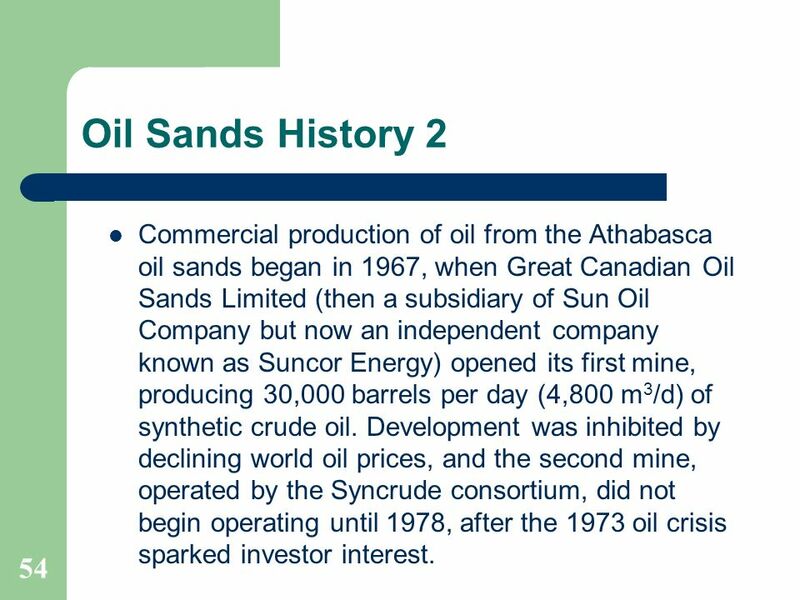 54 Oil Sands History 2 Commercial production of oil from the Athabasca oil sands began in 1967, when Great Canadian Oil Sands Limited (then a subsidiary of Sun Oil Company but now an independent company known as Suncor Energy) opened its first mine, producing 30,000 barrels per day (4,800 m3/d) of synthetic crude oil. 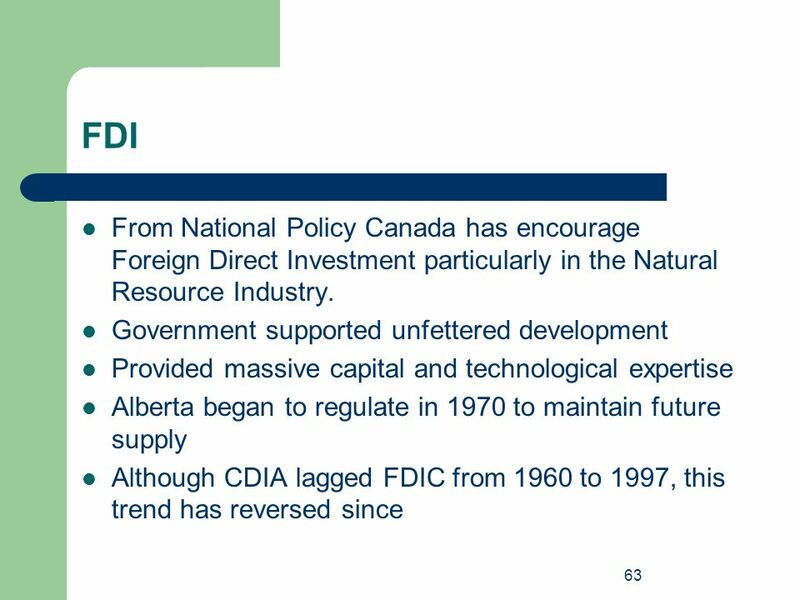 Development was inhibited by declining world oil prices, and the second mine, operated by the Syncrude consortium, did not begin operating until 1978, after the 1973 oil crisis sparked investor interest. 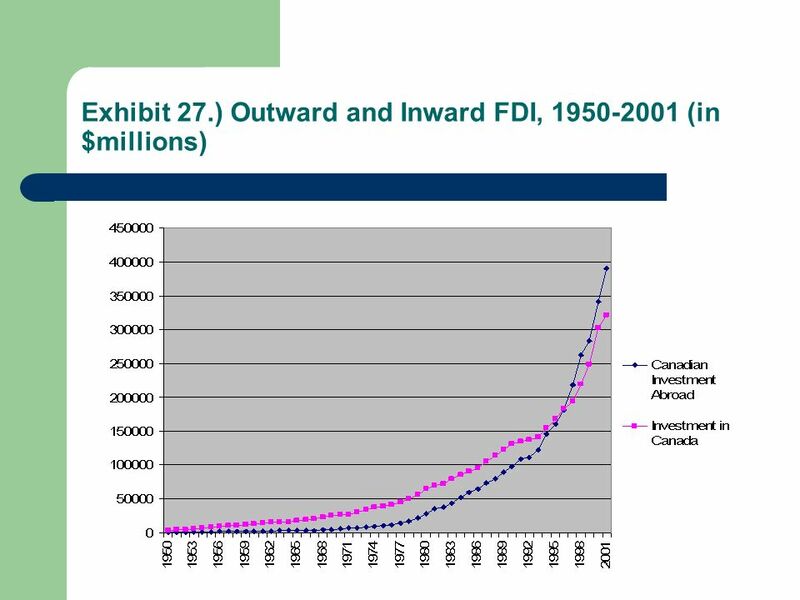 60 NAFTA - 2 Why has NAFTA become a destination rather than a point of departure? 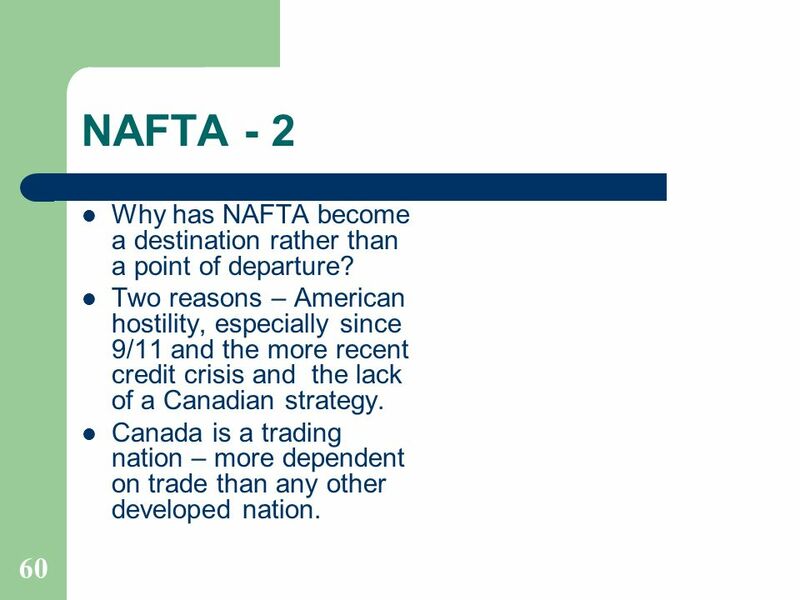 Two reasons – American hostility, especially since 9/11 and the more recent credit crisis and the lack of a Canadian strategy. 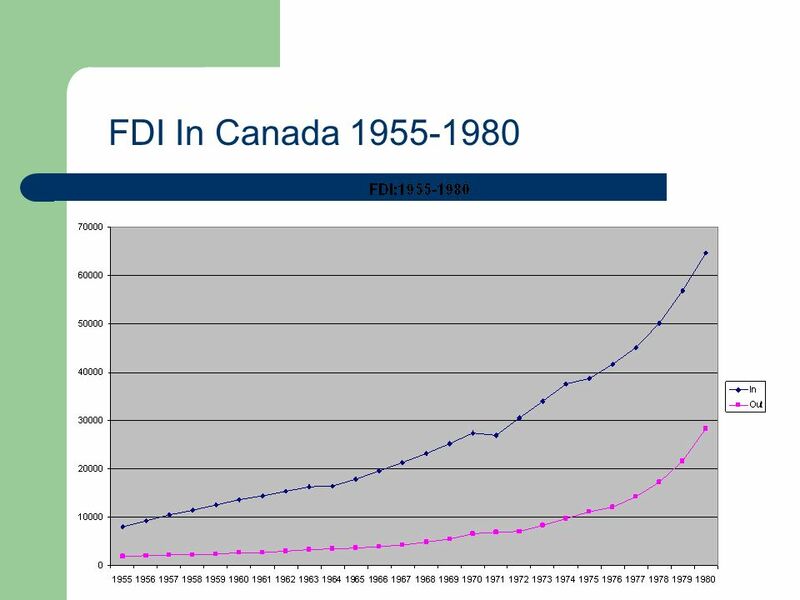 Canada is a trading nation – more dependent on trade than any other developed nation. 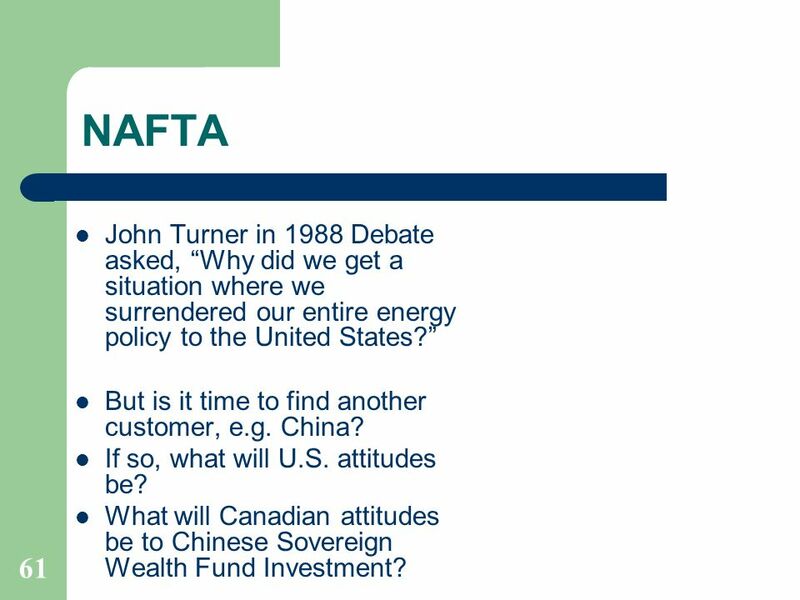 61 NAFTA John Turner in 1988 Debate asked, “Why did we get a situation where we surrendered our entire energy policy to the United States?” But is it time to find another customer, e.g. 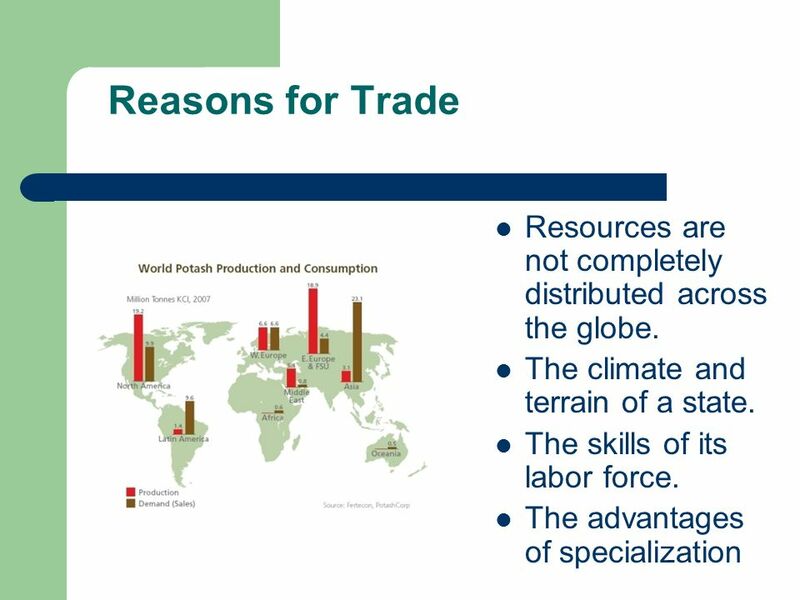 China? 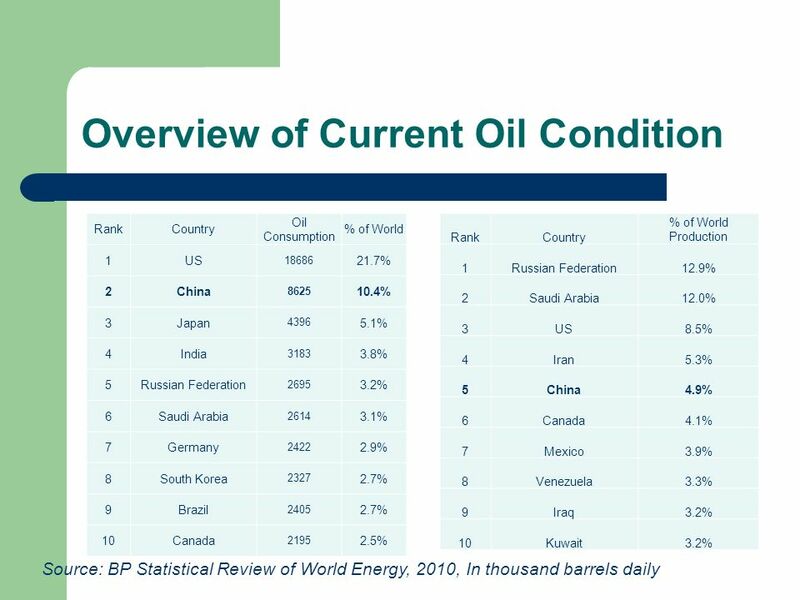 If so, what will U.S. attitudes be? 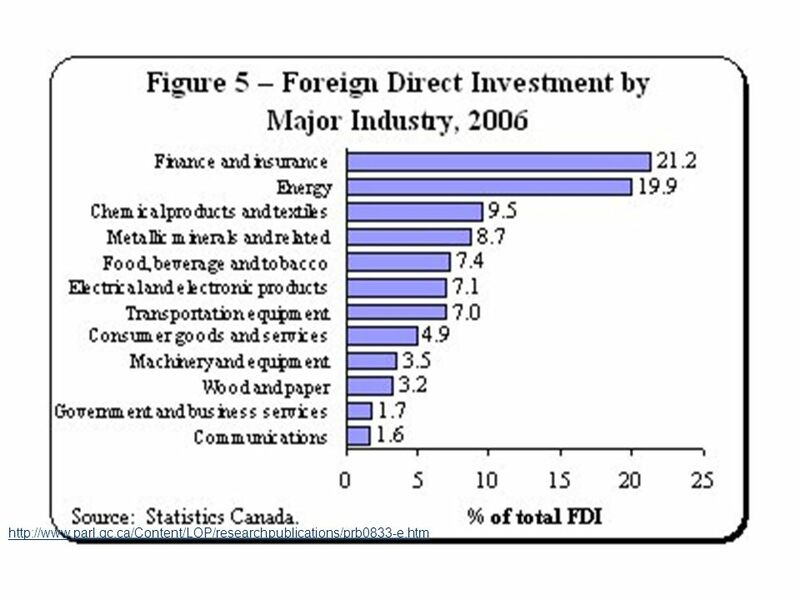 What will Canadian attitudes be to Chinese Sovereign Wealth Fund Investment? 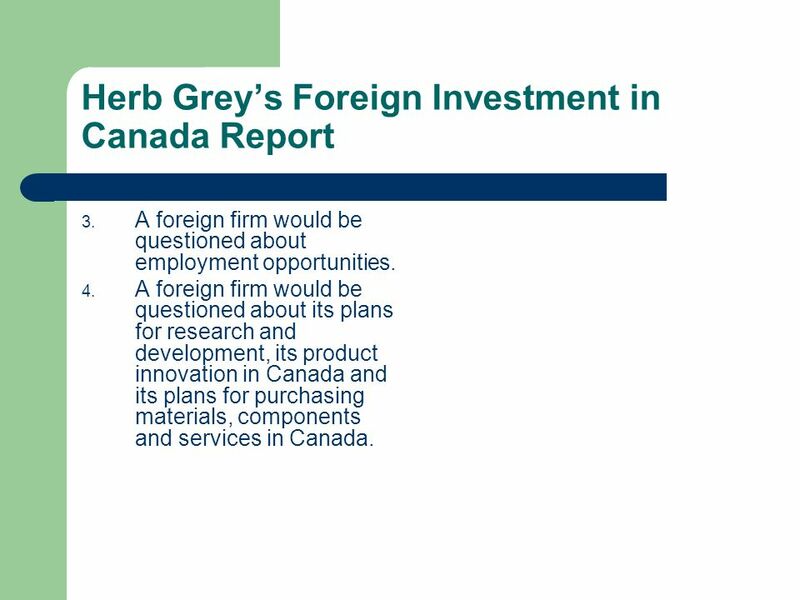 A foreign firm would be questioned about employment opportunities. 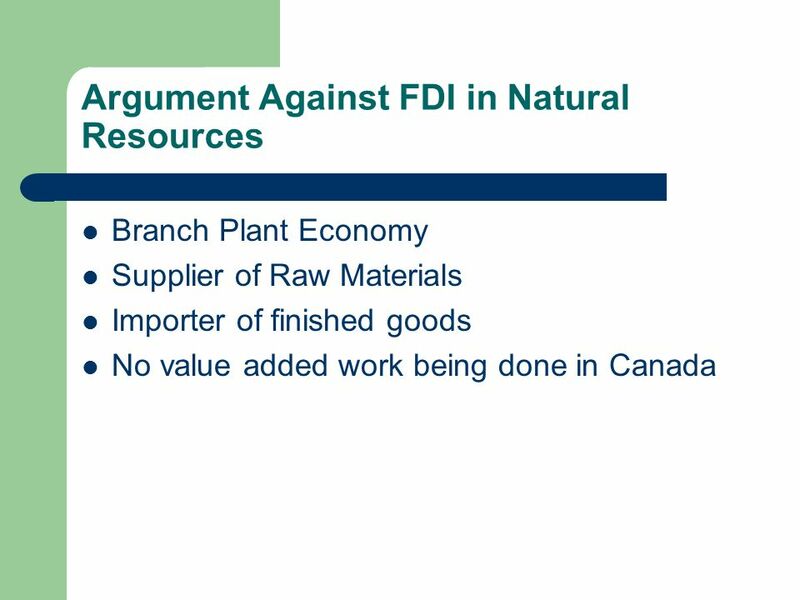 A foreign firm would be questioned about its plans for research and development, its product innovation in Canada and its plans for purchasing materials, components and services in Canada. 71 When Should Government Act? 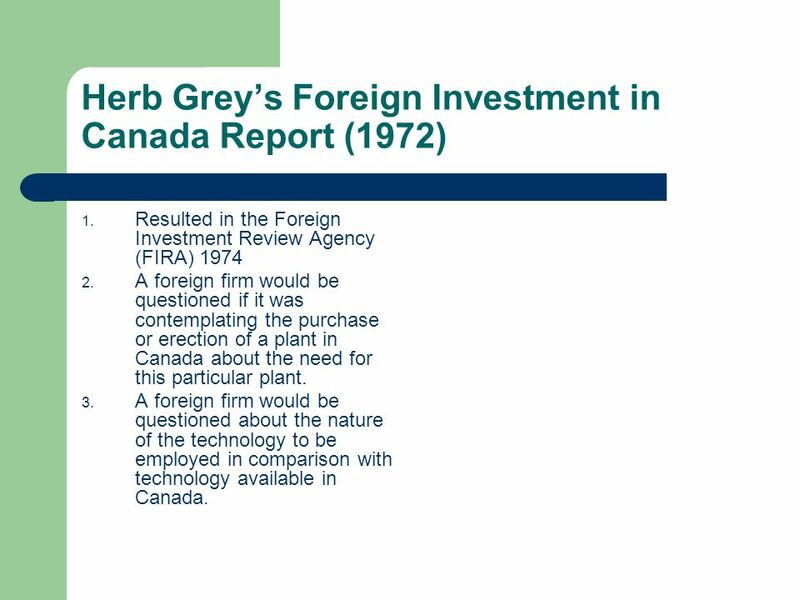 74 Changing Canada While there the changes in Canada’s international relations is just becoming apparent the changes within Canada are much clearer. 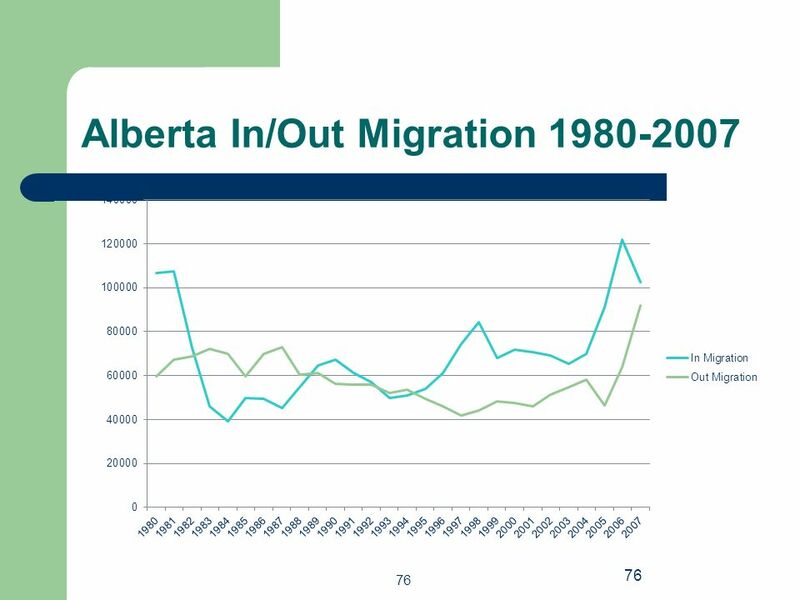 Ontario is growing faster than the national average because of international migration but Alberta is growing much faster than Ontario because of international and interprovincial migration. 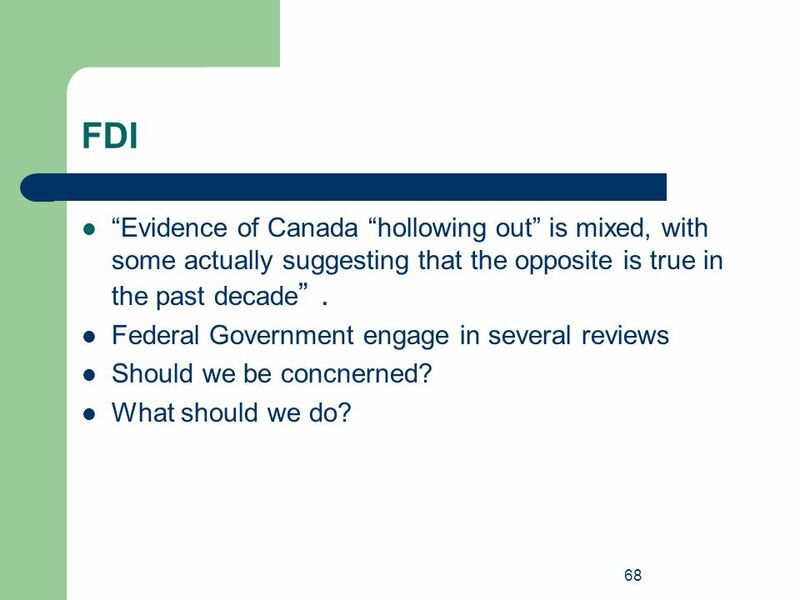 Ontario has become a ‘have not’ province. 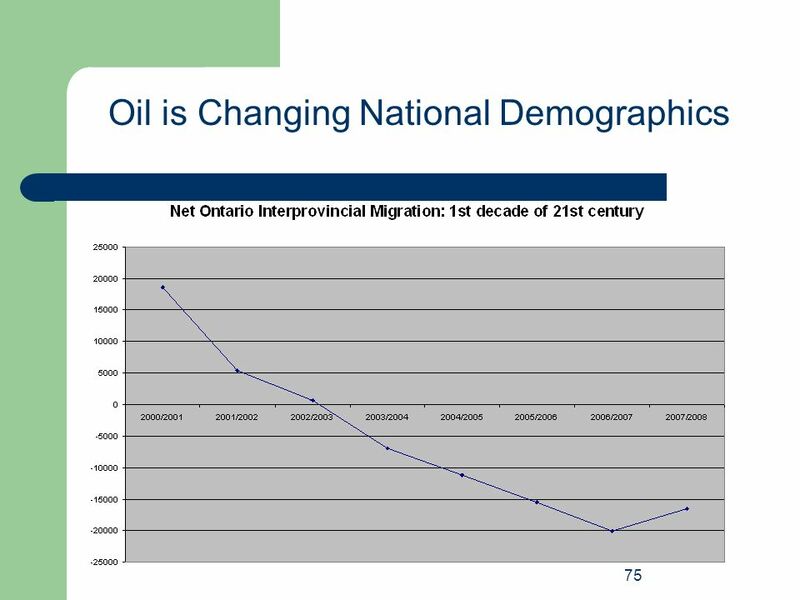 Not only is Ontario losing population to Alberta, Toronto is losing head offices, see next slides. 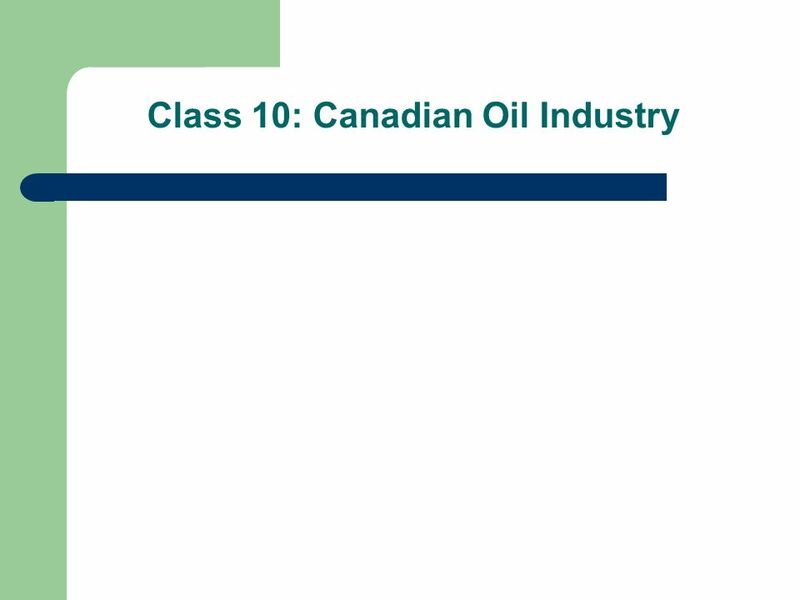 Download ppt "Class 10: Canadian Oil Industry"
A sample problem. 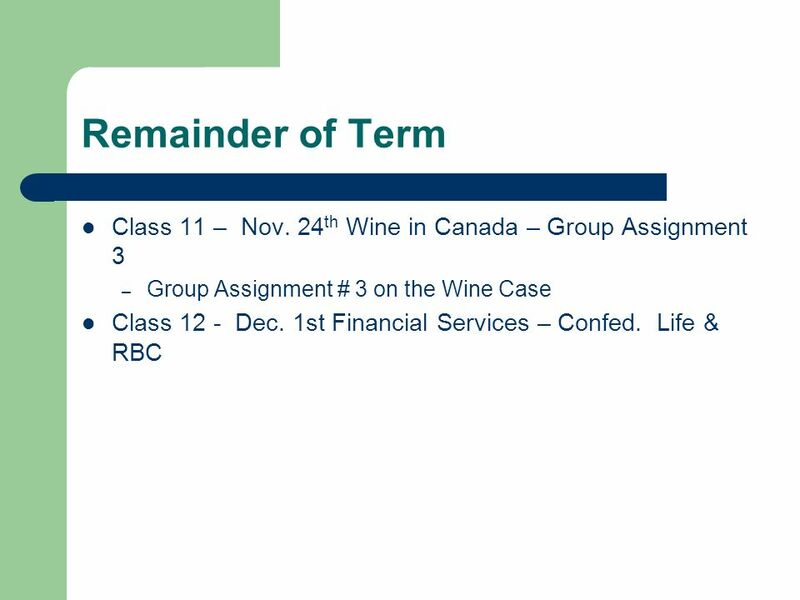 The cash in bank account for J. 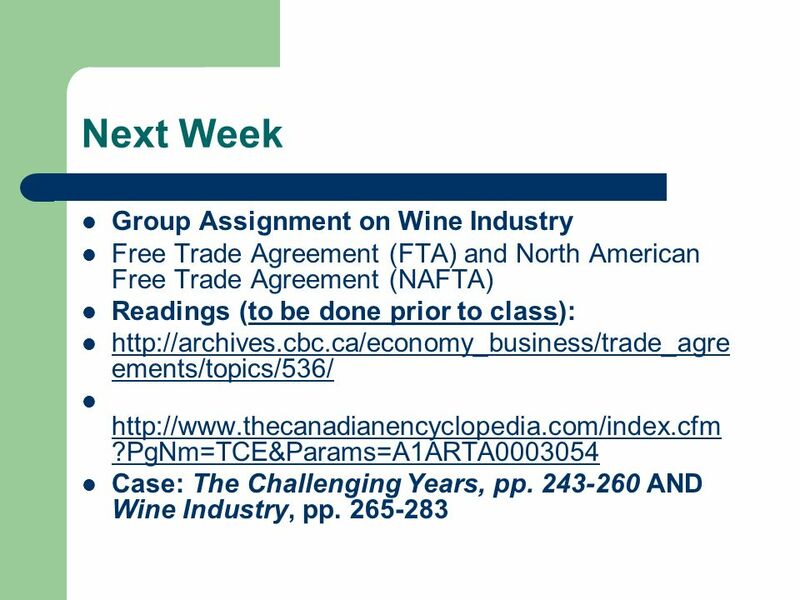 B. Lindsay Co. at May 31 of the current year indicated a balance of $14, after both the cash receipts. 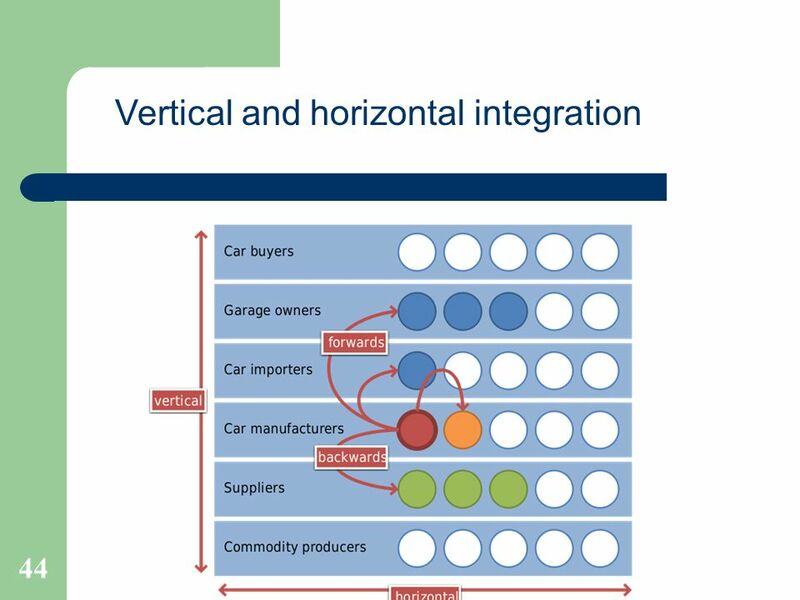 Energy Market Tutorial Presented by Company Webb. 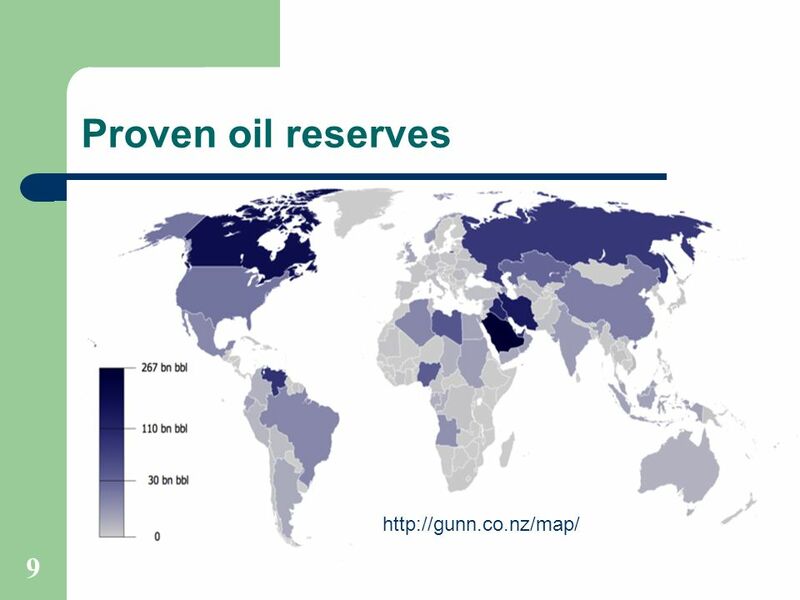 Black Gold How has the discovery of oil affected the region of the Middle East and its people?